Out-of-plane tissue deformations are key morphogenetic events during plant and animal development that generate 3D shapes, such as flowers or limbs. However, the mechanisms by which spatiotemporal patterns of gene expression modify cellular behaviours to generate such deformations remain to be established. We use the Snapdragon flower as a model system to address this problem. Combining cellular analysis with tissue-level modelling, we show that an orthogonal pattern of growth orientations plays a key role in generating out-of-plane deformations. This growth pattern is most likely oriented by a polarity field, highlighted by PIN1 protein localisation, and is modulated by dorsoventral gene activity. The orthogonal growth pattern interacts with other patterns of differential growth to create tissue conflicts that shape the flower. 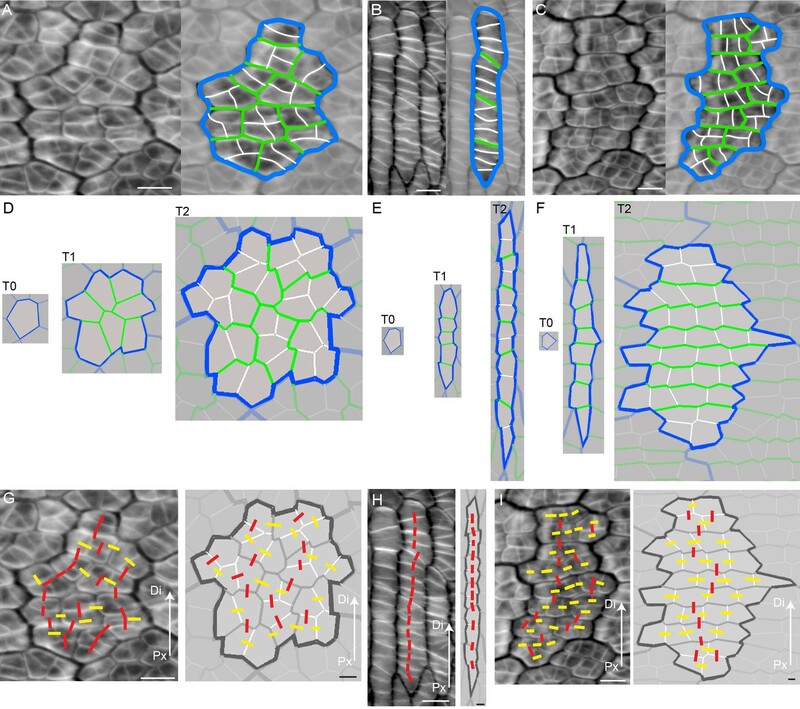 Similar shape changes can be generated by contraction as well as growth, suggesting tissue conflict resolution provides a flexible morphogenetic mechanism for generating shape diversity in plants and animals. Plant and animal organs come in many different shapes, from pitcher-shaped leaves and butterfly wings, to orchid flowers and the convoluted shape of the brain. Unlike pottery or sculpture, no external hand guides the formation of these biological structures; they arise on their own, through sheets of cells developing into particular three-dimensional shapes. But how does this process of self-making operate? We know that patterns of gene activity are important, because mutations that disrupt these patterns change the shape of the organ. But it is not clear how these patterns lead to sheets of cells curving and bending themselves into their characteristic three-dimensional shapes. Plants are particularly useful tools for studying how three-dimensional organs form because, unlike animals, their cells do not slide relative to each other, which makes the analysis simpler. Rebocho et al. used a combination of computational modelling and cell analysis to study how the intricately shaped flowers of plants known as Snapdragons form. The experiments show that genes control the shape of Snapdragon flowers by causing groups of cells to grow at different rates and in different directions. This pattern of growth creates internal conflicts that are resolved by sheets of cells curving in particular ways, accounting for the three-dimensional shape. Rebocho et al. propose that the principles of tissue conflict resolution described in this work may also underlie the development and evolution of many other plant and animal organ shapes. A future challenge is to identify the cellular mechanisms that link patterns of gene activity to the generation and resolution of conflicting cell behaviours. 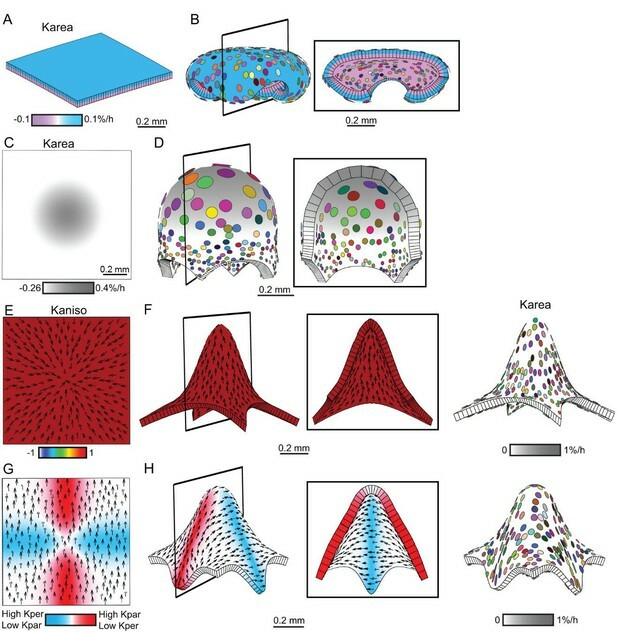 Out-of-plane deformation of tissue sheets plays a fundamental part in morphogenesis. In animals, it underlies processes such as gastrulation, neurulation, convolution of the cerebral cortex, gut folding, development of imaginal discs and dorsal appendages. Several models have been proposed to account for such deformations, involving a variety of processes such as differential surface contractions, oriented tissue tensions and differential growth (Chen and Brodland, 2008; Clausi and Brodland, 1993; Conte et al., 2008; Hannezo et al., 2014; Osterfield et al., 2013; Savin et al., 2011; Tallinen et al., 2014; Wyczalkowski et al., 2012). In plants, cell rearrangements and contractions play little or no role in morphogenesis, which is largely driven by growth. Nevertheless, out-of-plane tissue sheet deformations lead to the formation of elaborate structures such as floral spurs, the orchid labellum and pitcher-shaped leaves. These observations raise the question of how out-of-plane tissue deformations are generated in such diverse systems and how they relate to underlying patterns of gene activity and cell behaviours. Plants are a good starting point for addressing this question as lack of cell movement simplifies analysis. A key feature of out-of-plane deformations is that they involve generation of curvature (local rotations out of the plane). Two mechanisms might account for the generation of local rotations for a tissue sheet. The first is that local rotations arise through forces external to the sheet pulling or pushing on particular regions. For example, petals (whorl 2) grow in between sepals (whorl 1) and stamens (whorl 3), and these adjacent organs could apply forces to shape the petal. However, homeotic mutants that change the identity of stamens to petals do not have a major effect on the complexity of whorl 2 petal shape (Bradley et al., 1993), making it unlikely that such a mechanism plays a major role in this case. The second mechanism is that regions within the tissue sheet are specified to grow at different rates and/or directions. Local rotations can arise because they reduce or resolve potential conflicts brought about by such differential growth (Coen and Rebocho, 2016), as without regions curving or rotating relative to each other, greater levels of stress would be generated. We refer to this second mechanism, in which heterogeneity of specified growth within the tissue leads to local rotations that reduce potential stresses, as tissue conflict resolution (for a more mathematical definition of tissue conflict resolution see Materials and methods). To clarify the notion of tissue conflict resolution we distinguish between two types of growth: specified and resultant (Kennaway et al., 2011). Specified growth is how a region of tissue would deform if it was free from the mechanical constraints of its neighbouring regions. Resultant growth is how a region deforms in the context of neighbouring mechanical constraints, and includes anisotropies and local rotations that emerge from such constraints. Specified growth therefore refers to the intrinsic or active properties of a region, which may be influenced by local gene expression, while resultant growth also includes the passive changes that arise through connectivity with other regions. It is usually not possible to infer specified growth patterns directly from observed deformations (which reflects resultant growth). 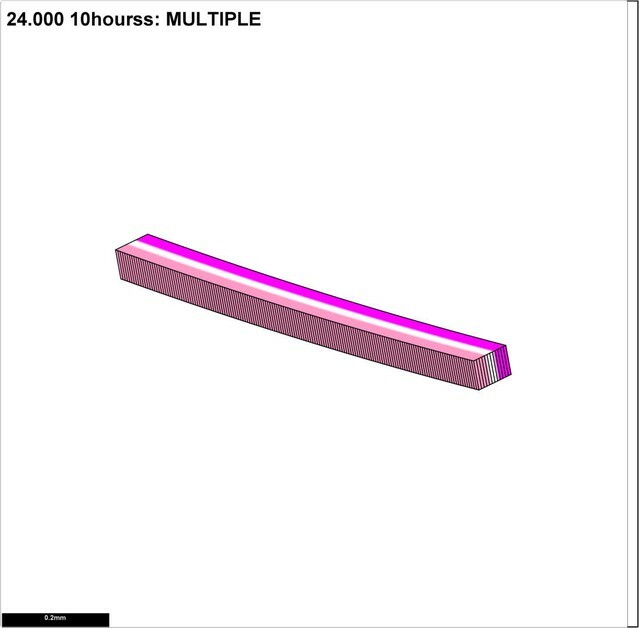 Modelling allows the consequences of particular hypotheses for specified growth to be evaluated and compared to the data on resultant growth, such as clones and shape deformations. To illustrate how patterns of specified growth may lead to out-of-plane deformations, consider a square sheet of tissue marked with circular spots (virtual clones, Figure 1A). If specified growth is equal in all directions (isotropic specified growth) and a growth-promoting transcription factor, GTF (red shading in Figure 1), is expressed uniformly, the tissue simply gets larger (Figure 1B, Video 1). Alternatively, specified growth could also be anisotropic, in which case regions have the intrinsic property of growing preferentially in one orientation. A simple way to establish such orientations in a tissue is through a polarity field (arrows Figure 1C). If specified growth is higher parallel to the local polarity, the tissue elongates (Figure 1D, Video 2). In both of these examples, all regions within the tissue grow in a similar way without constraining each other, so resultant growth is the same as specified growth. There is no tissue conflict and local rotations are not generated. Generation of 3D deformations through tissue conflict resolution. (A–B) Isotropic specified growth promoted by a uniformly expressed Growth-promoting Transcription Factor (GTF, red shading). The initial square marked with circular clones (A) grows into a bigger square with enlarged isometric clones (B). (C–D) A proximodistal polarity field (white arrows) with uniformly expressed GTF promoting growth parallel to the polarity (specified anisotropic growth). The square (C) elongates to from a rectangle (D). (E–F) Surface conflict. GTF promotes specified isotropic growth and is expressed at a higher level in the top surface (red, adaxial, ad) compared to the bottom (pink, abaxial, ab) (E). The canvas deforms into a dome with downwards curled edges (F). (G–H) Areal conflict. GTF promotes specified isotropic growth and is more highly expressed in the centre of the canvas (G). The canvas deforms into a rounded dome with circular clones bigger at the apex (H, side view in left panel and clipped view in right panel) and slightly elliptical at the periphery of the dome (blue square in H). (I–J) Directional conflict with a convergent polarity field (white arrows) and GTF promoting growth parallel to the polarity. The square deforms into an elongated dome with clones elongated parallel to the polarity field (J, side view in left panel, clipped view in right panel). For each model the position of the clipping plane is indicated by black line in the side view. 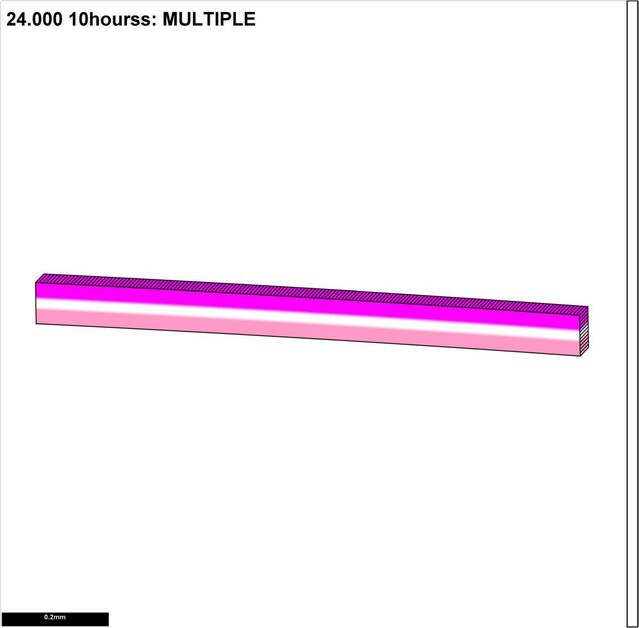 Isotropic growth model as in Figure 1B. The size of the canvas is not rescale to better show the increase in canvas size. Anisotropic growth model as in Figure 1D. Local rotations and curvature can result through spatial variation in specified growth, causing buckling or bending of the tissue. We may define three types of conflict leading to local rotations: surface, areal and directional. 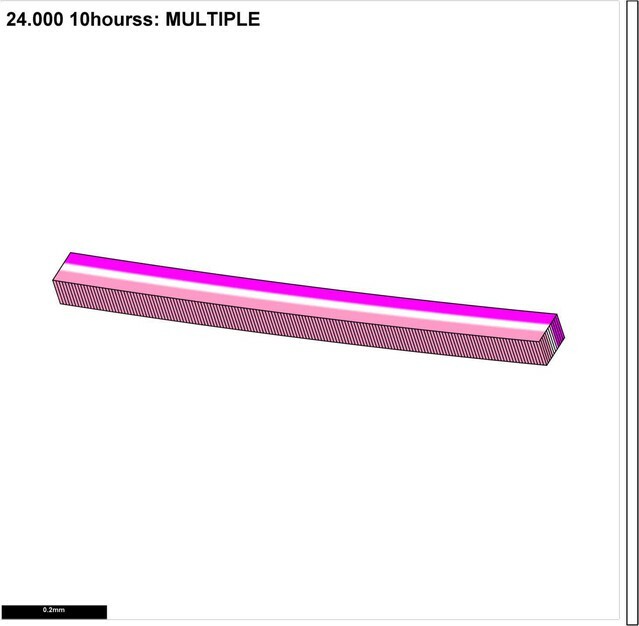 If GTF promotes isotropic growth and is expressed at higher level in the top compared to the bottom surface (red vs pink shading in Figure 1E), the tissue folds as this reduces the potential conflict in growth between of the two surfaces (surface conflict, Figure 1F, Video 3). 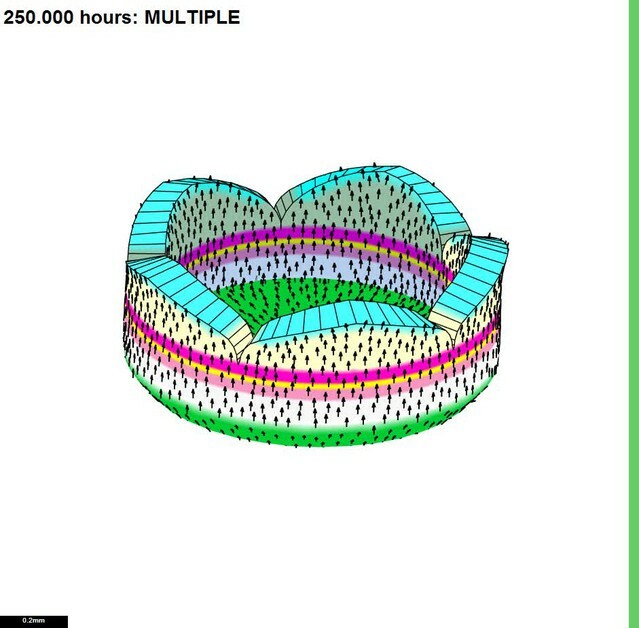 If GTF is expressed at a higher level in the centre of the tissue compared to the surround (Figure 1G), the areal conflict is reduced by the tissue buckling and formation of a round dome (Figure 1H, Video 4). The direction (up or down) and pattern of buckling may be biased if the sheet has an initial slight curvature generated by surface conflict, or variable if it is initially flat with slight random perturbations in height (Figure 1—figure supplement 1A–B). Even though specified growth is isotropic, anisotropies may result from areal conflict. For example, clones in regions with low specified growth become stretched circumferentially (blue box in Figure 1H) by nearby faster growing regions. These anisotropies are a passive result of residual stresses generated by differential growth, rather than being directly specified locally. 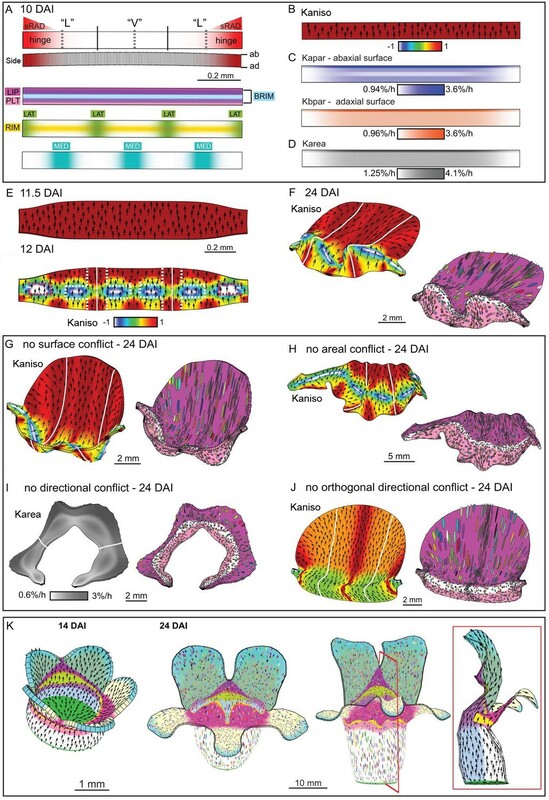 Residual stresses arise because local rotations only partially resolve the areal conflict (for more details, see description of tissue conflict resolution in Materials and methods). Examples of buckling arising through areal conflict have been described previously (Conte et al., 2008; Green, 1992; Nath et al., 2003; Shi et al., 2014). Surface conflict model as in Figure 1F. Size of canvas is rescaled to better visualise the deformation of the canvas. Areal conflict model as in Figure 1H. A third type of conflict is generated when the orientations of specified growth vary. For example, if the polarity field converges at the centre of the tissue (Figure 1I) and specified growth rate is higher parallel to the polarity, the directional conflict is partially resolved by buckling and formation an elongated dome (Figure 1J, Video 5). Virtual clones are elongated along the radial axis of the dome (Figure 1J). In this example, directional conflict involves a non-parallel polarity field, but it could also involve variation in specified growth rates in relation to polarity. As with areal conflict, the direction of buckling can be biased through initial curvature (Figure 1—figure supplement 1C–D). Directional conflict as in Figure 1J. Unlike surface and areal conflicts, directional conflicts have been little explored. They have been proposed to be involved in generating the Snapdragon corolla shape, during a repatterning event (Green et al., 2010; Kennaway et al., 2011). However, the precise pattern these conflicts take and their operation at the cellular level has not been tested. Here we address this problem using a combination of cellular and tissue analysis, together with modelling at different levels of complexity. We show that an orthogonal pattern of directional conflict contributes to the out-of-plane deformation of the lower corolla. This pattern is likely established by a combination of orthogonal gene activity with a polarity pattern visualised by PIN1 localisation. The directional conflict interacts with surface and areal conflicts to generate the corolla shape and curvature. Dorsoventral genes modulate all three types of conflict accounting for a range of phenotypes in wild type and mutants. We propose that genetically controlled tissue conflict resolutions may provide a general mechanism for generating out-of-plane deformations in both plants and animals, despite different underlying cell behaviours. The bilaterally symmetric Snapdragon (Antirrhinum majus) corolla has five petals united for part of their length to form a tube with five separate lobes, which diverge at their sinuses (Figure 2A–B). The upper part of the corolla comprises two dorsal petals, while the lower part consists of a pair of lateral petals flanking a ventral petal (Figure 2A). The corolla functions like a mouth, with the lower corolla articulated at a hinge to open or shut (hinge, Figure 2B). Several genes controlling dorsoventral asymmetry and flower shape in Snapdragon have been characterised. CYCLOIDEA (CYC), DICHOTOMA (DICH) and RADIALIS (RAD) encode dorsal-specific transcription factors that repress the ventral identity gene DIVARICATA (DIV) (Almeida et al., 1997; Corley et al., 2005; Luo et al., 1999, 1996). Wild-type and div Snapdragon corolla morphology. (A–E) Wild-type bilaterally symmetric Snapdragon flower, with dorsal (D), lateral (L) and ventral (V) petals (A). The flower has a closed mouth hinged at the dorsal to lateral sinuses (hinge). The corolla is divided into a proximal region (tube) and distal region (lobes) (B). Dissected and partially flattened lower petals, imaged from above (C, adaxial surface, i.e. inside the flower) and side (D) (black and white images are used to allow labelling of petal regions). Along the proximodistal axis, the distal wedge limit is the boundary between the lip and the distal lobe (white dashed line), and the proximal wedge limit is the boundary between the palate and the proximal tube (red dashed line). Along the mediolateral axis, the lateral petal midveins (orange lines) are the lateral wedge limits. Ventral petal midvein (yellow line), petal junctions (blue dashed lines), foci (asterisks) and petal sinuses (blue arrows) are also labelled. A simplified clay model of the wedge shape (E) illustrates the slope (palate, light pink), ridge (rim, yellow dashed line) and cliff (lip, dark pink). Experimentally induced clonal sectors (Green et al., 2010) are superimposed on the 3D shape (multi-coloured regions). The wedge spans the ventral petal and the ventral half of the lateral petal (flanks) while the dorsal half of the lateral petal forms a narrow region either side (hinge, green shading in C and E). (F–J) div mutant flower, with normal dorsal petals (D), modified lateral and ventral petals (‘L’ and ‘V’) (F), and an open flower (G). To compare the shape of the div mutant with wild type, the div mutant lower petals were dissected, flattened, imaged from above (H, adaxial side) and from the side (I) and labelled as for wild type. The div mutant has two domes at the foci (asterisks in H–J). A simplified clay model (J) highlights the reduction of palate (light pink shading) and the flat lip (dark pink shading). The most striking feature of the wild-type lower corolla is a wedge-shaped fold (Figure 2C–D), represented in a simplified form in Figure 2E. The wedge comprises a platform (palate) that slopes up towards a ridge (rim) and a descending lip (Figure 2C–E). The rim rises to form two small peaks at the junctions between lateral and ventral petals (foci, Figure 2A and C–E). DIV is required for the development of the wedge-shaped fold. In div mutants, the wedge-shape of the lower corolla is lost and two small domes form at the foci (Figure 2F–J). To determine the regional origins of the wedge of wild type, we created a fate map (Figure 3) using morphological landmarks such as sinuses between petals (blue arrows), main veins (yellow and orange lines) and trichomes (purple ellipse, from 14 DAI = Days After petal Initiation) (Figure 3A–G). The first visible sign of wedge formation was a shallow furrow proximal to the petal sinuses at 12 DAI (yellow bracket, Figure 3B). Prior to this, the lower corolla showed no out-of-plane deformation (Figure 3A). During the next 5 days, the furrow became more pronounced and the regions that will form the palate and lip could be identified as two crescents by 14 DAI (light and dark pink, Figure 3C). These crescents spanned the ventral petal together with half the lateral petal on each side, referred to as the flanks (boundary marked by the lateral midvein, Figure 3A–G). The other halves of the lateral petals grew less in width and formed the hinge (green shading, Figure 3C–G). Over the next seven days the crescent bulged further to form the wedge with a slope and steep lip (Figures 3E–G and 2C–D). Thus, the wedge initiates from a narrow strip of tissue at the tube-lobe boundary that undergoes an out-of-plane deformation through a defined series of morphogenetic events. Morphogenesis and fate map of div and wild-type lower corollas. (A–G) Fate map of wedge emergence in the wild-type lower corolla. The 3D deformation of the lower petals was visualised by OPT (Lee et al., 2006) with a longitudinal midsection across the ventral petal (highlighted with white shading in left panels of A-D) and by photographing the partially flattened lower corolla (right panels), labelled with various morphological landmarks as Figure 2. The boundary between the palate and the proximal tube (red dashed line) can only be determined after palate trichome emergence at 14 DAI (purple ellipses). At early stages of development, 11 DAI (A) and 12 DAI (B), the lower petals develop a furrow at the rim (yellow bracket in B) although they still appear relatively flat. During the next five days (C and D), the furrow gets more pronounced and can be clearly seen at 17 DAI (yellow bracket in D). From 18 DAI, the out-of-plane deformation is visible from side (left panel in E-G) and top (right panel in E-G) views of the dissected corolla. The size of the wedge increases over the next four days (compare E to G). Scale bars, 100 µm (A–D) and 1 mm (E–G). (H–J) Fate map of dome emergence in the div lower corolla. The div lower corolla was dissected and partially flattened at 11 DAI (H), 14 DAI (I) and 17 DAI (J), and labelled with various morphological landmarks as for wild type, except for the boundary between the palate and the proximal tube, which is difficult to determine at these stages due to the lack of palate trichomes. Initially, petals are relatively flat (H). At 14 DAI small adaxial bulges, with foci at their tips (asterisks in I), can be seen at the intersection between the petal junctions and the rim. 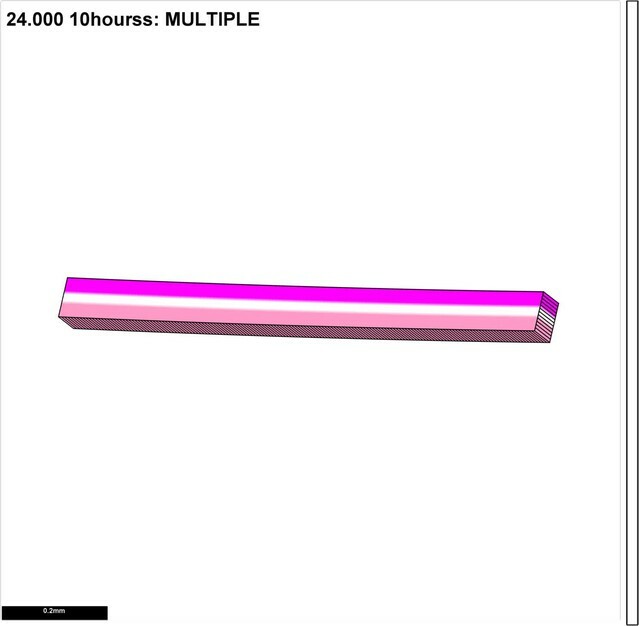 This is also the first timepoint when the lip region can be mapped (dark pink). By 17 DAI, the domes extend half way into the lateral petals (orange line in J). Scale bars, 100 µm. In contrast to wild type, the mature div flower has an open mouth and lacks an extended palate (Figure 2F–G). The ventral corolla has two small domes where the tube-lobe boundary (yellow dashed line) intersects the ventral-lateral petal junctions (blue dashed line) (Figure 2H–J). The centres of intersection correspond to the foci (asterisks in Figure 2H–J). Initially, the div lower petals showed no out-of-plane deformation (Figure 3H).The domes first became evident as small out-of-plane adaxial bulges at 14 DAI, and were clearly visible by 17 DAI (Figure 3I–J). At these stages, we mapped the lip region to a crescent-shaped region distal to the domes (Figure 3I–J). To determine how these out-of-plane deformations might relate to cellular behaviours, we analysed the pattern of cell files in div and wild type, at different stages of development by staining the petal tissue with calcofluor white. Calcofluor stains older walls less brightly than younger walls, and reveals a range of different cell patterns (Figure 4). For example, old walls (highlighted in blue) may surround a region of cells subdivided by randomly oriented recent walls (highlighted in green or white, Figure 4A). Or old walls may surround a region subdivided by a ladder of perpendicular recent walls (Figure 4B), or a region subdivided by recent perpendicular walls (green), which are in turn further subdivided by more recent walls (white) perpendicular to these (Figure 4C). Inferring growth orientations from cell division patterns. (A–C) Confocal images of petal tissue showing different shapes of cell files (or clones). The cell walls were stained with calcofluor white (left panels). The most recent cell walls stain the brightest and are the thinnest (indicated by the white lines), intermediate cell walls stain less and are thicker (green lines), and the oldest cell walls are the thickest and hardly stain (blue lines). The three examples show different patterns observed on developing petals. Scale bars, 10 μm. (D–F) Simulated growth patterns that generate the shape of cell files (or clones) and pattern of cell divisions depicted in A–C. Original cell wall (T0) blue, cell walls formed during T1 in green (thinner than the T0 cell walls), and cell walls formed at T2 in white (the thinnest cell walls). Specified growth isotropic (D), oriented vertically (E), or oriented vertically and then switching to horizontal (F). Scale bars, 10 μm. (G–I) Inferring growth orientations from the patterns of cell division in the calcofluor data using lines perpendicular to cell division walls. 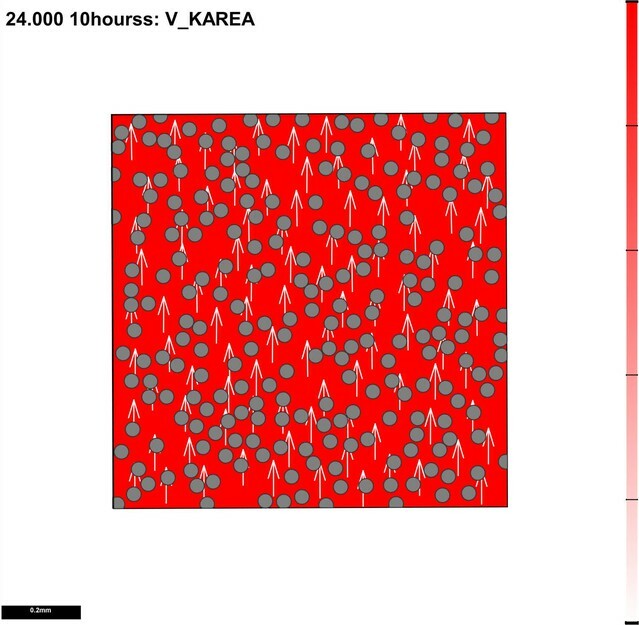 For each panel, biological data is shown on left, simulation output on right. Lines were classified as roughly parallel (red) or perpendicular (yellow) to the proximodistal axis (Px-Di for data) or to the orientation of specified growth (simulations). The simulations show output for isotropic growth (G) vertically oriented specified growth (H) or vertical followed by horizontally oriented specified growth (I). Scale bars, 10 μm. To understand the origin of these patterns, we modelled cell divisions using the Growing Polarised Tissue (GPT framework), in which the tissue is treated as a connected continuous material, termed the canvas (Kennaway et al., 2011). This is the same framework used to model the deformations illustrated in Figure 1. Within the GPT framework, specified anisotropic growth is oriented by a polarity field that propagates through the canvas. Regional gene activities modify local specified growth rates parallel (Kpar) or perpendicular (Kper) to the polarity field. Plant cells can be readily imposed on this framework because cell topology is preserved: once a vertex is created by division, its relation to other vertices is maintained through subsequent growth (plant cells do not move relative to each other). We assume that when the area of a cell exceeds a threshold, it is divided along the shortest path through its centroid (Errera, 1886; Besson and Dumais, 2011). The new wall is then shortened slightly to give more realistic angles (Nakielski, 2000). Cell wall colour and thickness reflect wall age (Figure 4D–F). If specified growth was isotropic and uniform, the resulting pattern of walls resembled that of Figure 4A, with the blue outline highlighting the clone derived from the original cell (Figure 4D). Within the clone, cell walls were oriented randomly (Figure 4D). If specified growth was uniformly anisotropic, with growth oriented proximodistally (vertically in Figure 4), a pattern similar to that seen in Figure 4B was generated, where division walls were largely perpendicular to the main orientation of growth (Figure 4E). If specified growth was initially oriented proximodistally and then switches to mediolateral, a pattern similar to that in Figure 4C was generated (Figure 4F). Similar patterns of division occurred irrespective of initial cell geometries, although the shape of the final clone varied (Figure 4—figure supplement 1). Thus, the calcofluor pattern gives an indication of the history of cell divisions, and orientations of growth. Lines perpendicular to the cell walls reflect growth oriented parallel (red lines) or perpendicular (yellow lines) to the proximodistal axis of the tissue (Figure 4G–H). Calcofluor staining of developing div and wild-type petals showed that at 10 DAI, growth was largely oriented parallel to the proximodistal axis (red lines in Figure 5A–B). In the next three days, cells in regions flanking the presumptive foci showed a switch to mediolateral growth (yellow lines in Figure 5C–D, Figure 5—figure supplement 1A–B and F–G). This growth pattern continued so that by 15 DAI a clear orthogonal pattern of cell files was observed in the div mutant, with cell files being elongated medially at the tube-lobe boundary flanking the foci, proximodistally at the petal junctions and mostly isotropic at the intersection (Figure 5E). In wild type, the orthogonal pattern of cell files at 15 DAI was less clear than in div as the rim flanking the ventral-lateral petal showed a mixture of cell wall orientations, indicating greater proximodistal growth (compare Figure 5F to Figure 5E). There was also a region of enhanced mediolateral growth in the lateral (lilac box, Figure 5F) and ventral lip (green box in Figure 5—figure supplement 1H). In addition, diagonally oriented cell files were observed near the sinus (orange lines in blue box in Figure 5F). The observed pattern of growth at 15 DAI was maintained through later stages of div and wild-type development (Figure 5—figure supplement 1C–D and I) and correlated with the regions of the petal that formed out-of-plane deformations (Figure 5—figure supplement 1E and I). Thus, there was a switch to mediolateral growth in regions flanking the foci prior to and during the out-of-plane deformation, which was modulated by the activity of DIV. The timing of this switch was in line with the repatterning of growth predicted previously (Green et al., 2010). Pattern of cell file orientations at the ventral-lateral junctions during div and wild-type development. (A–F) Confocal images of div and wild-type ventral-lateral (V–L) junctions at 10 DAI (A and B), 13 DAI (C and D) and 15 DAI (E and F). The tissue was stained with calcofluor white to visualise the patterns of cell division and infer growth orientations as described in Figure 4G–H: proximodistal growth (red lines), mediolateral growth (yellow lines) and diagonal growth (orange lines). Each stage is shown in two magnifications: an overview of the junction region and a zoomed-in region (coloured boxes in A-F). Only regions showing the clearest cell files and oriented patterns of division are shown in the overview images. The patterns of cell files at the div and wild-type V-L junction are mainly proximodistal at 10 DAI (A and B) and become increasingly mediolateral in the rim regions flanking the junction forming an orthogonal pattern of cell files by 13 DAI (white dashed lines in C and D). At 15 DAI, the mediolateral region expands and together with the proximodistal files at the junction form a clear orthogonal pattern of growth orientations in div (white dashed lines in E). In wild type, the orthogonal pattern is not as clear as the rim region flanking the foci and shows a mix of mediolateral and proximodistal growth (blue box in F) but extends to the lateral lip, where predominantly mediolateral growth is observed (purple box in F) in contrast to the mixed proximodistal and mediolateral growth in the div lateral lip (purple box in E). Arrow at the lower right corner of each. panel indicates Proximal (Px) and Distal (Di) axis. Scale bar 100 μm, except for purple boxes of E and F where scale bar is 10 μm. 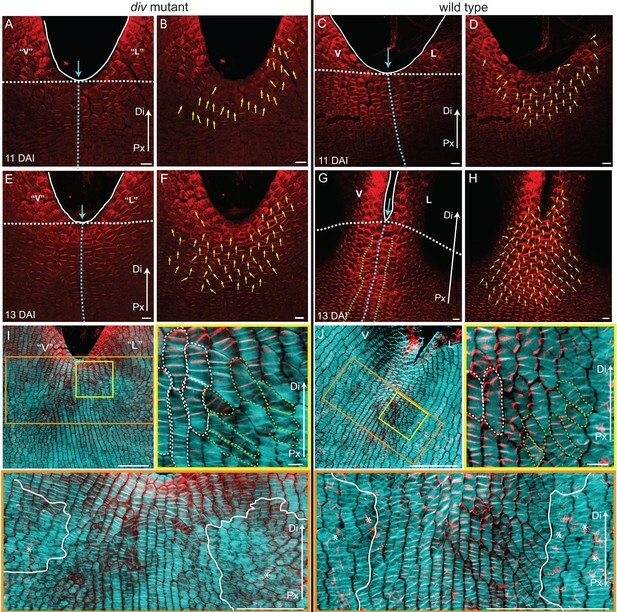 To determine whether this growth repatterning was specific to the ventral-lateral junctions, we analysed cell files at the lateral-dorsal junction (Figure 5—figure supplement 2). An orthogonal pattern of cell files was again observed at a similar stage, but in contrast to the ventral-lateral junction, the distal arm of the orthogonal pattern did not grow. Thus, repatterning occurred at all petal junctions of the lower corolla but with varying growth dynamics. The orthogonal patterns of anisotropic growth observed in wild type and div suggests that an orthogonal directional conflict may be involved in generating these out-of-plane deformations. To explore this idea further, we simulated orthogonal conflicts using a square initial canvas, similar to that used in Figure 1. We introduced several transcription factors with different expression domains into the initial canvas: a factor expressed in a vertical strip (JUN, Figure 6A), a horizontal strip (RIM, Figure 6B), the right half (HALFSIDE, Figure 6C) and upper half (DISTALSIDE, Figure 6D). We first assumed a polarity field converging at the centre, similar to that employed in Figure 1I. To generate an orthogonal pattern of specified anisotropy, while keeping areal growth rate uniform across the canvas (Figure 6E), we assumed both RIM and JUN promoted specified growth parallel to the polarity (Kpar) and inhibited specified growth perpendicular to the polarity (Kper) (the ratio of Kpar to Kper is indicated by Kaniso in Figure 6). Growth was specified to be isotropic where RIM and JUN overlap. This set of assumptions created an orthogonal pattern of specified anisotropic growth (red and yellow regions Figure 6F) next to quadrants of specified isotropic growth (green regions, Figure 6F). Running a model based on these assumptions led to the formation of a dome (Figure 6G, Video 6), with clones more elongated within the orthogonal domains of high specified anisotropy than in adjacent quadrants (red ellipse, Figure 6G). The anisotropy exhibited by the quadrants was the result of passive deformation rather than being specified directly. Generation of domes through orthogonal tissue conflicts. (A–D) Expression pattern of four growth regulatory factors. JUN is expressed as a vertical domain in the middle of the canvas (A), RIM as a horizontal line in the middle of the canvas (B), HALFSIDE in the right side of the canvas (C) and DISTALHALF in the upper half of the canvas (D). In all models the Karea = (Kpar + Kper) was maintained uniform throughout the canvas (E). (F–O) Orthogonal directional conflict models. In the first example Kpar is enhanced in an orthogonal domain established by JUN and RIM but not at the intersection of these factors (F) to generate a dome with clones more elongated in the arms of the orthogonal domains (red ellipse) than in the neighbouring quadrants (G). Modifications to this orthogonal pattern generated variously shaped domes (H–O). A T-shaped pattern (H) generated an asymmetric dome (J). An L-shaped pattern (J) gave a less pronounced asymmetric dome (K), while removing both side arms of high anisotropy (L), gave a ridge with clones more elongated along it (M). Removing all arms but one gave an asymmetric ridge (N–O). (P–U) An orthogonal pattern of directional conflict in a parallel polarity field, generated by boosting Kpar by JUN while boosting Kper by RIM (P). This specified growth pattern generated an elongated dome with clones elongated parallel to the polarity along the regions of high Kpar (red ellipse in Q) and perpendicular to the polarity along the regions of high Kper (black ellipse in Q). Between these regions clones are more isodiametric (Q). Boosting isotropic growth with JUN and RIM (Karea in R) resulted on the formation of four bulges but no dome (S). An orthogonal pattern of directional conflict can also be generated with a channel of proximodistal polarity in the JUN domain, and mediolateral polarity in flanking regions (T). An orthogonal domain of high Kpar generates a wide dome (U). Kaniso = ln (Kpar /Kper). The colour scale for Kaniso is –1 to +1. Orthogonal directional conflict model as in Figure 6G. The contribution of the orthogonal directional conflict to shape could be further dissected by removing components. Removing one of the regions of high specified anisotropy by introducing dependence of RIM activity on HALFSIDE, gave an asymmetric dome (Figure 6H–I, Video 7). 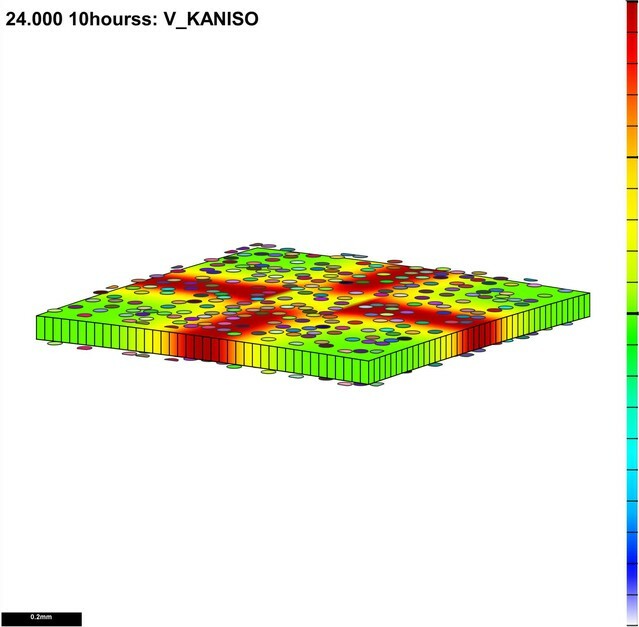 Removing two regions of anisotropy, by making JUN activity dependent on DISTALHALF, and RIM activity dependent on HALFSIDE (Figure 6J), produced a less pronounced asymmetric dome (Figure 6K, Video 8). Removing both horizontal regions of high anisotropy by removing RIM activity, gave a ridge (Figure 6L–M, Video 9). Removing all regions but one, by making specified anisotropy dependent on the combination of JUN with DISTALHALF, resulted in a slightly arched and symmetric ridge (Figure 6N–O, Video 10). Thus, various types of out-of-plane deformation may be generated by varying the pattern and extent of directional conflict. T-shaped orthogonal directional conflict model as in Figure 6I. L-shaped orthogonal directional conflict model as in Figure 6K. I-shaped directional conflict model as in Figure 6M. One arm directional conflict model as in Figure 6O. To determine other ways of generating orthogonal directional conflicts, we considered a parallel rather than convergent polarity field. An orthogonal conflict could be generated by JUN promoting Kpar (and inhibits Kper), while RIM promoted Kper (and inhibits Kpar) (Figure 6P). A dome was again generated, with the polarity field being deformed by growth so that it passed over and around the dome (Figure 6Q, Video 11). Virtual clones were oriented parallel to the polarity in the JUN domain (red ellipse, Figure 6Q) and perpendicular to the polarity in the RIM domain (black ellipse in Figure 6Q). Orthogonal directional conflict model as in Figure 6Q. In all the above cases, the axial information provided by the polarity field was critical for the resulting shape. Boosting isotropic growth in an orthogonal pattern (areal conflict) generated a series of bulges rather than a dome (Figure 6R–S, Video 12). Orthogonal areal conflict model as in Figure 6S. Orthogonal directional conflict resolution thus provides a mechanism for generating out-of-plane deformations, and can be specified in several ways through a combination of orthogonal regional identities and polarity fields (convergent or parallel). Further dome shapes can be generated by combining the orthogonal directional conflict with areal and surface conflicts (Figure 6—figure supplement 1A–C), or by combining surface and areal conflicts (Figure 6—figure supplement 1D). In the above examples, we modelled deformations as arising through differential growth. In animals, contractions as well as growth may be involved in generating out-of-plane deformations. In early animal embryogenesis it is common for deformations to occur without overall change in size. To determine how principles of tissue conflict resolution could apply in these contexts, we modelled deformations that preserve overall size. For these purposes, contraction could be considered as equivalent to negative growth. For surface conflict, high specified isotropic growth of the upper surface was counterbalanced by an equal negative specified growth rate (contraction) for the lower surface, and gave a folded shape similar to that based on differential growth (compare Figure 7A–B to Figure 1E–F). For areal conflict, negative specified isotropic growth at the periphery was counterbalanced by high specified growth in the centre, and gave a shape again similar to that based on increased growth alone (compare Figure 7C–D to Figure 1G–H). For directional conflict, enhanced growth parallel to polarity (positive Kpar) was counterbalanced by negative specified growth perpendicular to the polarity (negative Kper), and gave a similar result to overall positive growth (compare Figure 7E–H to Figure 1I–J and Figure 6P–Q). Such a balance between growth in one orientation and contraction in the perpendicular orientation is equivalent to the process of convergent-extension (Keller et al., 2008). Surface, areal and directional conflict resolutions, thus provide possible mechanisms for generating out-of-plane deformations with or without overall growth. Generation of domes by tissue conflicts through contraction and growth. Similar shape domes to Figure 1 can be generated using a combination of contraction and growth, with overall canvas size remaining the same. (A–B) Surface conflict. Uniform isotropic specified growth for one surface (blue) and isotropic specified contraction (negative growth) for the other surface (lilac), causes an initial square (A) to deform into a dome with downward curled edges (B). (C–D) Areal conflict. Isotropic specified growth in the centre counterbalanced by contraction at the edges causes the square canvas (C) to deform into a rounded dome with circular clones which are bigger at the apex (D). (E–F) Directional conflict with a convergent polarity field. Uniformly high specified growth parallel to the polarity is counterbalanced by uniformly high specified contraction perpendicular to the polarity. The canvas deforms from an initial square (E) into a dome with elongated clones parallel to the polarity field (F). (G–H) Orthogonal directional conflict with a parallel polarity field. High specified growth parallel to the polarity in the vertical domain (red) and perpendicular to the polarity in the horizontal domain (blue) are counterbalanced by contraction perpendicular to the polarity in the vertical domain and parallel in the horizontal domain (G). A dome is generated with clones elongated parallel to the polarity in the red domain and perpendicular to the polarity in the blue domain (H). Kaniso = ln(Kpar /Kper). The colour scale for Kaniso is –1 to +1. Karea = Kpar + Kper. Given the cell file data, we hypothesise that orthogonal directional conflict is involved in generating the out-of-plane deformation in div and wild type. This hypothesis requires a polarity field for orienting the growth in each region. To test whether a polarity field is present and determine its pattern of orientations, we analysed PIN1 auxin transport protein distribution as this is a possible readout of cell polarity (Steinmann et al., 1999). The Snapdragon genome has 11 PIN genes, three of which are PIN1 orthologues (PIN1a, PIN1b and PIN1c). RNA in situ hybridisation revealed that the three PIN1 genes showed detectable expression in developing wild-type petals, with all PIN1 orthologues strongly expressed in the vascular tissue and epidermis in the palate region of the lower petals (Figure 8—figure supplement 1). To determine protein localisation, we raised peptide antibodies against each of the three proteins, as well as a generic antibody against a conserved domain in all three. The antibody raised to the PIN1a-based peptide gave the clearest signal. As this peptide shares some amino acids with the other PIN1s, we cannot be sure that the signal derives entirely from PIN1a and therefore refer to the signal obtained as PIN1 signal. Immunolocalisations on sectioned tissue showed that PIN1 signal is localised at the distal end of epidermal cells in early wild-type petal primordia, with abaxial and adaxial polarity converging at the tip of the petal primordia (day 9, Figure 8—figure supplement 2A–C). This is in agreement with PIN1 patterns observed in emerging primordia in other species (O'Connor et al., 2014; Reinhardt et al., 2003). To analyse PIN1 polarity in regions undergoing out-of-plane deformations, we developed a whole-mount immunolocalisation protocol for plant tissue sheets, and software to quantify the distribution of PIN1 signal for each cell (PinPoint software). Prior to the repatterning of corolla growth in div and wild type, PIN1 is strongly expressed near the petal sinuses and margins, and is oriented proximodistally (Figure 8A–D and Figure 8—figure supplement 2D–E). This pattern extends over more cells proximally when the orthogonal pattern of cell files begins to form (13 DAI, Figure 8E–H and Figure 8—figure supplement 2F–G), overlapping with the distal region showing proximodistal cell files (Figure 8I–J). PIN1 is more extended in wild type than in div. Within the extended region, polarity is oriented proximodistally along the petal junction (3–4 central files within green dashed line in Figure 8G, Figure 8—figure supplement 2G). Either side of this, polarity points diagonally, towards the central files and nearby margins (Figure 8G, Figure 8—figure supplement 2G). In both div and wild type, the region with diagonal PIN1 polarity corresponds to that showing diagonal cell files (yellow boxes, Figure 8I–J). Strong PIN1 signal was not observed in the regions showing mediolateral cell files (orange boxes in Figure 8I–J). By 15 DAI, PIN1 expression domain became restricted to the petal margins (Figure 8—figure supplement 2H–I). The upregulation of PIN1 in wild type was not observed at the lateral-dorsal sinuses (Figure 8—figure supplement 2J–K), where DIV was not strongly expressed at this stage (Galego and Almeida, 2002). Thus, PIN1 reveals an early proximodistal polarity pattern near the sinus which is modulated by DIV to become extended and deflected during repatterning. PIN1 polarity and correlation with cell file orientation. (A–H) Whole-mount immunolocalisation in div and wild-type ventral-lateral junctions using the antibody raised to the PIN1a peptide at 11 DAI (A–D) and 13 DAI (E–H). Left panels show confocal images of PIN1 immunolocalisation (red signal). Right panels depict the average PIN1 polarity (yellow arrows) calculated using the PinPoint software. At 11 DAI, PIN1 is expressed at the ventral-lateral petal junction (blue dashed line) just below the sinus (blue arrow) and points proximodistally towards the petal margin (white outline) in both div (A and B) and wild type (C and D). At 13 DAI, PIN1 expression extends more proximally in div (E and F) and to an ever greater extent in wild type (G and H). The PIN1 polarity in wild type has a central region of 2–3 proximodistal files (within green dashed line in G) and flanking regions with diagonal polarity deflected towards the central files (G and H). Scale bar, 10 μm. Px, proximal, Di, distal. (I and J) Confocal images of div (I) and wild-type (J) ventral-lateral junctions at 13 DAI combining the immunohybridised PIN1a antibody signal (red) with the calcofluor white cell wall signal (cyan) at different magnifications (yellow and orange boxes). When overlapping, the orientation of the cell files correlates with the pattern of cellular PIN1 polarity: proximodistal cell files have proximodistal PIN1 polarity (e.g. files marked with white dashed lines in yellow boxes) while diagonal cell files have diagonally oriented PIN1 polarity (e.g. files marked with green dashed line in yellow boxes). The region of PIN1 expression does not overlap with the region where the mediolateral growth is observed (white outlines in oranges boxes). Asterisks refer to subepidermal PIN1 signal in the vascular tissue. Scale bar (E and F), 100 μm and (G) 10 μm. In light of the data above on fate mapping, cell files and PIN1 localisation, we modelled corolla morphogenesis, beginning with the simpler deformation observed in div. Rather than modelling the entire div corolla, we first modelled the region forming the out-of-plane deformation. Based on the fate map experiments, the div and wild-type out-of-plane deformations develop from a curved strip of tissue at the tube-lobe boundary, encompassing the presumptive palate and lip (Figure 3). We therefore used a strip of canvas as the initial configuration for our minimal model (Figure 9A). The strip was convex on the abaxial and concave on the adaxial surface, as observed for this region of the corolla before out-of-plane deformation. Growth rates were modulated by regional identity factors distributed along three axes – proximodistal, mediolateral and dorsoventral – similar to those employed previously (Green et al., 2010). The dorsoventral factor was a diffusible signal derived from the dorsal region, sRAD, and specified the hinge region of the lateral petal (red shading in Figure 9A). The proximodistal factors included PALATE (PLT), RIM and LIP (Figure 9A), which corresponded to distinct regions and cell types in the flower (Keck et al., 2003). RIM was a diffusible signal that activated the expression of BRIM to subdivide the regions of PLT and LIP expression (Figure 9A). The mediolateral factors LAT and MED corresponded to the petal junctions and midvein regions, respectively (Figure 9A). All of these factors interacted combinatorially to control the specified rates of growth parallel (Kpar) and perpendicular (Kper) to the polarity field (details of interactions are given in Supplementary Material and methods). As PIN1 cellular localisation was only observed around the sinus and was mainly proximodistal, we made the simplest assumption that polarity is maintained as proximodistal throughout the canvas (black arrows in Figure 9B). Alternatively, polarity outside the PIN1 upregulation domain may reorient to point towards the petal junction to create a region of mediolateral polarity flanking a channel of proximodistal polarity (Figure 6T–U, Video 13). Tissue-level model of div corolla development. (A–F) Modelling formation of div domes. (A) The initial shape represents a strip of tissue at the tube to lobe boundary, from which the domes develop (Figure 3H–J). The strip is slightly curved to represent the initial petal shape, as shown in the side view of the canvas thickness (Side). During the setup phase, several identity factors are established in domains along three different axes: (1) dorsoventral – sRAD which grades into the lateral petals from the dorsal petals, (2) proximodistal - LIP, PLT, RIM and BRIM and (3) mediolateral - LAT at petal junctions, and MED in the midvein region. (B) These factors interact combinatorially to control the specified rates of growth parallel (Kpar) and perpendicular (Kper) to the proximodistal polarity field (black arrows). Growth is initially higher in Kpar than in Kper (Kaniso). (C) Surface conflict introduced by differential growth at the rim. Kapar is specified Kpar on the abaxial surface of the canvas, whereas Kbpar is specified Kpar on the adaxial surface. The lower value of Kapar relative to Kbpar in rim region will lead to bending of the canvas at the rim. (D) Growth rate is higher in the LIPDISTAL region (see darker grey in the distal region of the canvas), and inhibited at the hinge region by sRAD (lighter shade of grey at the lateral edges of canvas. (E) The above pattern of growth produces a strip with short hinge region at 11.5 DAI just before the time of repatterning. At 12 DAI, an orthogonal pattern of directional conflict is introduced. Kpar is enhanced by LAT around the petal junctions (white lines) and inhibited by RIM, while Kper is enhanced by RIM and inhibited by MED and LAT (the orthogonal pattern of anisotropy is marked by dashed white lines for the lateral-ventral junctions, and red dashed lines for the lateral-dorsal junction). (F) Growth following repatterning leads to a shape at 24 DAI similar to the div lower lip, with two domes at the foci region and an extended asymmetric lip (left panel shows Kaniso, while right panel shows the LIP and PLT regional factors and virtual clones). Virtual clones are predominantly elongated along the proximodistal domain except in the RIM region where clones are mediolateral oriented. (G–J) Evaluating the contribution of growth conflicts to the shape of the div model. 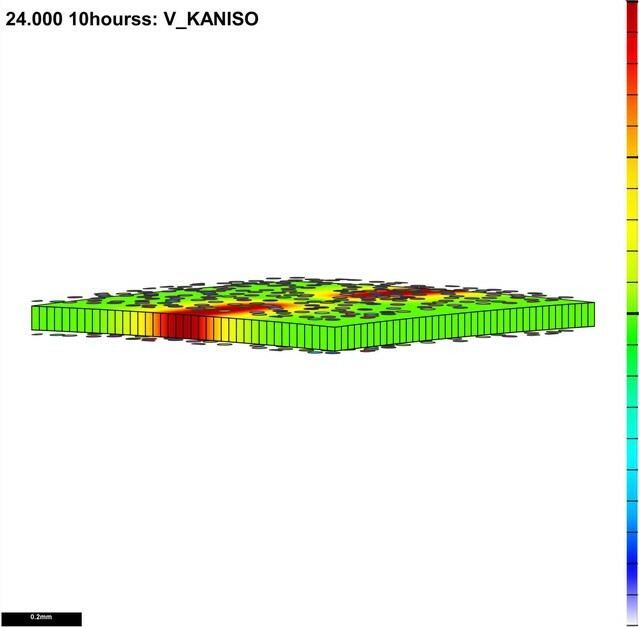 (G) Removal of surface conflict produced a similar shape as in F but the out-of-plane deformations protrude towards the abaxial side instead of the adaxial side (left panel shows Kaniso, while right panel shows the LIP and PLT regional factors and virtual clones). (H) Removal of areal conflict, by normalising the areal growth across the canvas while maintaining the anisotropy, generated a curved canvas with long hinge region and abaxial protruding foci. (I) Removing all directional conflict by setting polariser to zero, so that all growth is isotropic, resulted in a curved narrow strip with slight bulges at the region of the high growth in the div (dark grey areas around the petals junctions. (J) Removing only the orthogonal directional conflict, resulted in a canvas with a broad flat lip and a uniform bend at the RIM without domes. (K) Incorporating the above div patterns of areal, surface and directional conflict into the full Snapdragon model produced a div mutant corolla with an extended lip (dark pink), short palate (pink) and two domes at the RIM (yellow) centred on the foci. Canvas shown at 14 DAI and maturity (24 DAI). Kaniso = ln(Kpar /Kper). The colour scale for Kaniso is –1 to +1. Karea = Kpar + Kper. Orthogonal directional conflict model as in Figure 6U. For our minimal model of div, growth of the initial strip was specified to be higher parallel than perpendicular to the polarity (ratio of Kpar to Kper is indicated by Kaniso in Figure 9B). Kpar was also inhibited on the lower (abaxial) surface in the rim to promote out-of-plane bending (surface conflict, Figure 9C). Specified growth was further inhibited at the edges of the strip (hinge) through the activity of a dorsoventral gene (sRAD) (areal conflict, Figure 9D). Kpar was also promoted in the distal lip (areal and directional conflict, Figure 9D). These assumptions led to the generation of a bilaterally symmetric canvas with short lateral edges by 11.5 DAI (Figure 9E). 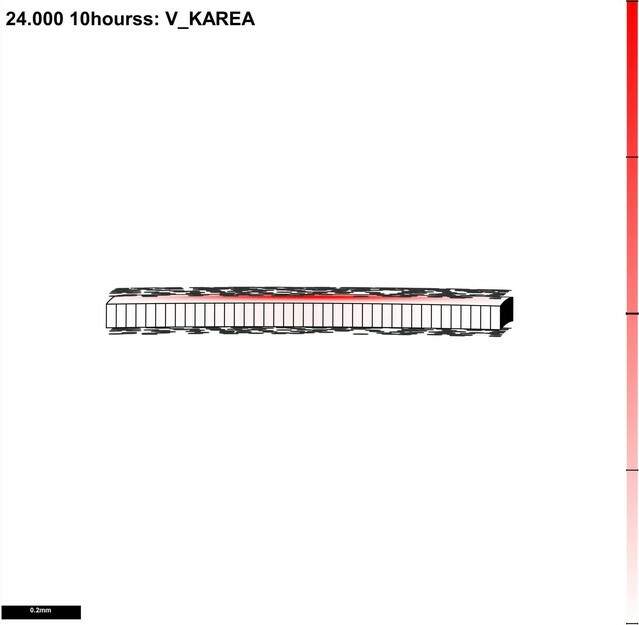 Orthogonal directional conflict was introduced at 12 DAI through combinatorial interactions that enhanced Kpar relative to Kper at the petal junctions, and enhanced Kper relative to Kpar along the rim (Kaniso panel in Figure 9E showing orthogonal pattern marked by dashed white lines). At the hinge, growth in the distal part of the orthogonal domain was inhibited by sRAD (red dashed lines in Figure 9E). In addition, Kper was inhibited by MED (Figure 9E). Running this model generated two domes centred on the foci, and an extended lip, matching the shape observed in div (Figures 9F and 2J, Video 14). div domes model as in Figure 9F. This model involved three types of conflict: areal, directional and surface. To evaluate the contribution of each type of conflict to the final shape, we removed each individually. Removing surface conflict (by equalising growth rates on the two surfaces) led to the out-of-plane deformations protruding abaxially instead of adaxially (Figure 9G and Video 15). This was because the direction of bulging reflected the curvature of the initial strip of tissue, which was abaxially convex (Figure 9A). Removing areal conflicts, by normalising the growth rates across the canvas, resulted in a crumpled strip with long hinge regions (Figure 9H, Video 16). Removing all directional conflict by eliminating polarity, while maintaining the patterns of areal and surface conflicts, generated a curved strip (Figure 9I, Video 17). Removing orthogonal directional conflict by removing the enhanced mediolateral growth at the rim generated a relatively flat shape with a bend at the rim (Figure 9J, Video 18). Thus, the out-of-plane deformation of div depends on all three types of conflict, with orthogonal directional conflict playing a key role in creating the domes. div domes model without surface conflict as in Figure 9G. div domes model without areal conflict as in Figure 9H. div domes model without directional conflict as in Figure 9I. div domes model without orthogonal directional conflict as in Figure 9J. The interactions from the above minimal model were incorporated into a model of the entire Snapdragon corolla to see if they could account for the overall final shape. We first modified the published full corolla model (Green et al., 2010) to create a ground state for the lower petals (see Supplementary Material and methods). This produced a corolla with a wild-type looking upper corolla, but a lower corolla lacking out-of-plane deformations (Figure 9—figure supplement 1A). Incorporating the interactions of the minimal div model above into this ground state produced a corolla with an open mouth, a reduced palate, two domes tipped by the foci and a flat extended lip, similar to the div phenotype (Figure 9K 2F, Video 19). As with the minimal model, removing orthogonal directional conflict generated a corolla with a bend at the rim for the lower corolla rather than two domes (Figure 9—figure supplement 1B). div full Snapdragon model as in Figure 9K. To explore the role of DIV, we incorporated its activity within the minimal model. In accordance with previous experimental data, we assumed that DIV expression was graded, from low levels at the lateral-dorsal junctions to high levels in the ventral petals (Figure 10A) (Galego and Almeida, 2002). Unlike the div mutant, the wild-type corolla has an extended palate and lip (forming the slope of the wedge, Figure 2E). We therefore assumed that DIV promotes Kpar in the palate and lip regions from an early stage (Kaniso, Figure 10B; Karea, Figure 10D). DIV also enhanced surface conflict by increasing the extent of differential growth parallel to the polarity between the two surfaces near the rim, consistent with differential expression of cell division genes in this region (Figure 10D; (Gaudin et al., 2000)). These assumptions generated a canvas similar to the div model at 11.5 DAI but with an extended palate (compare 11.5 DAI, Figure 10E with Figure 9E). To simulate the observed deflection of polarity towards the wild-type sinus at 12 DAI, we assumed DIV activates expression of a new polariser sink at the sinus (blue arrows, Figure 10E). To account for the observed patterns of orthogonal cell files in the wild type, we assumed that at 12 DAI DIV extends the region of high Kper flanking the foci into the lip region (white dashed lines, Figure 10E), enhancing directional conflict. Kper was also inhibited at the distal and proximal boundaries as a proxy for the restraining effect of adjacent tissue. Tissue-level model of wild-type corolla development. (A–J) Modelling of the wild-type wedge. (A) The regional identities are similar to those in div (Figure 9A) with the addition of the graded DIV expression (yellow shading) and a region, SEC, between the midvein and petal junctions (bottom panel). (B) Growth is initially higher in Kpar than in Kper (Kaniso). (C) DIV inhibits Kapar at the ventral-lateral junctions (whiter domain in Kapar), while the RIM region is kept short by DIV inhibiting Kpar slightly on both surfaces. (D) Growth is boosted in the region of the proximal lip and the palate (see darker grey regions in Karea). (E) The above pattern of growth results in a taller strip, compared to div, at 11.5 DAI (compare with Figure 9E). At 12 DAI (repatterning stage), DIV promotes Kper in combination with SEC and LIP, extending the region of high mediolateral growth (Kaniso, modified orthogonal pattern indicated with white dashed lines). DIV also activates expression of a minus organiser at the sinus (blue arrows), deflecting the polarity field towards it. 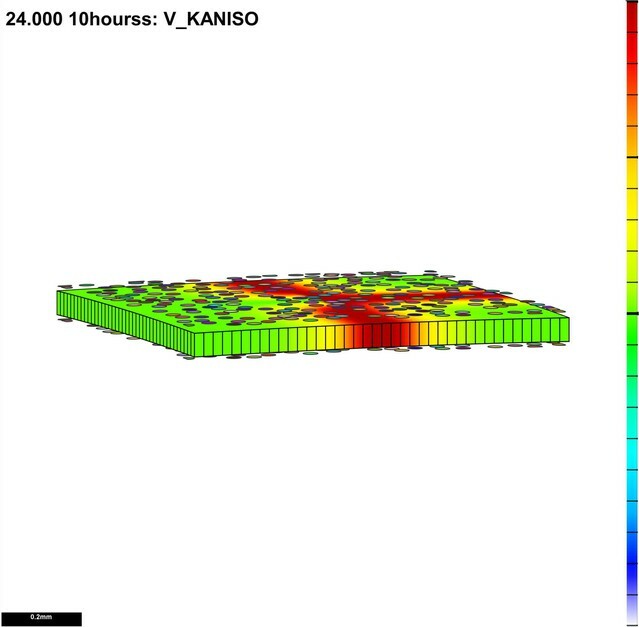 (F) The above specified pattern of growth leads to a shape and pattern of clone orientations similar to that of Figure 2E (left panel shows Kaniso while right panel shows the LIP and PLT regional factors and virtual clones). (G–J) Evaluating the contribution of growth conflicts to the shape of the wild-type wedge models. (G) Removal of surface conflict produced a similar shape as in F but the out-of-plane deformations protrude towards the abaxial side instead of the adaxial side. (H) Removing areal conflict generated a small wedge with protruding foci and a long hinge region. (I) Removing all directional conflict, resulted in a narrow strip with big bulges at the lateral petal which would normally form the flanks of the wedge. (J) Removing only the orthogonal conflict resulted in a shape with a long palate, sharp bend at the rim (left and middle panel) and a narrow lip (side view in right panel). (K) Incorporating the above growth patterns of areal, surface and directional conflict into the full Snapdragon model produced a closed mouth wild-type corolla, with an extended palate, a ridge at the rim and a steep lip. Canvas shown at 14 DAI and maturity (24 DAI). The region of deflection of polarity induced at the repatterning stage is shown enlarged at 14 DAI. Regions highlighted are lip (dark pink), palate (pink) and rim (yellow). Kaniso = ln(Kpar /Kper). 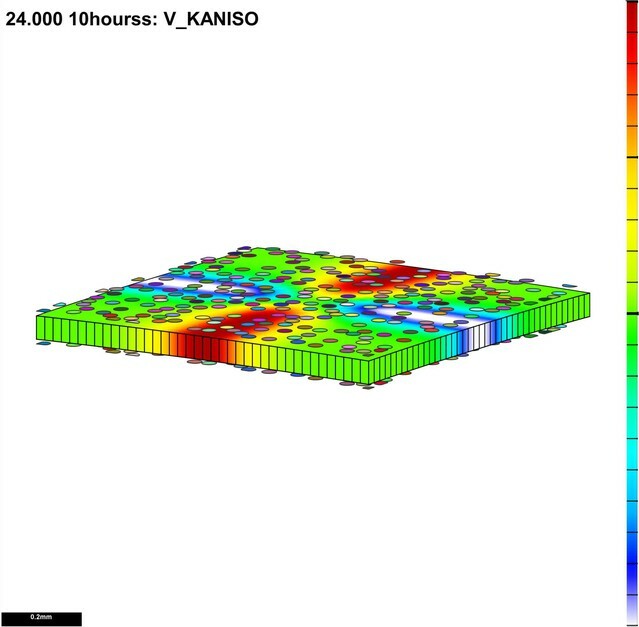 The colour scale for Kaniso is –1 to +1. Karea = Kpar + Kper. With these assumptions, a wedge shape was generated that resembled that observed in wild type (Figure 10F, Video 20). The pattern of growth could be compared with that of a wild-type flower by generating virtual clones, induced at 12 DAI. The pattern obtained was similar to that seen by mapping experimentally induced clones on the final wedge shape (Figure 2E). In both cases, clones were predominantly proximodistal throughout the palate and distal lip regions, but mediolateral in the flanking lip regions (compare Figure 10F to Figure 2E). Wild-type wedge model as in Figure 10F. As with the minimal model of div, we evaluated the contribution of each type of conflict to the final shape. Removing surface conflict led to the out-of-plane deformation protruding abaxially instead of adaxially (Figure 10G, Video 21). Removing areal conflicts resulted in a crumpled strip with long hinge regions and protruding domes with a narrow palate (Figure 10H, Video 22). Removing all directional conflict by eliminating polarity generated a curled canvas with two large domes in the lateral petal (Figure 10I, Video 23). Reducing orthogonal directional conflict by removing the enhanced mediolateral growth at the rim generated a sharp bend at the rim and a narrow lip region (Figure 10J, Video 24). Thus, as for div, morphogenesis of wild type depends on all three types of conflict, with directional conflict playing an essential role. Wild-type wedge model without surface conflict as in Figure 10G. Wild-type wedge model without areal conflict as in Figure 10H. Wild-type wedge model without directional conflict as in Figure 10I. Wild-type wedge model without orthogonal directional conflict as in Figure 10J. Integrating the activity of DIV into the full corolla model of div described above generated a corolla with a typical Snapdragon shape (Figures 10K and 2A, Video 25). Removing dorsoventral gene activities (i.e. 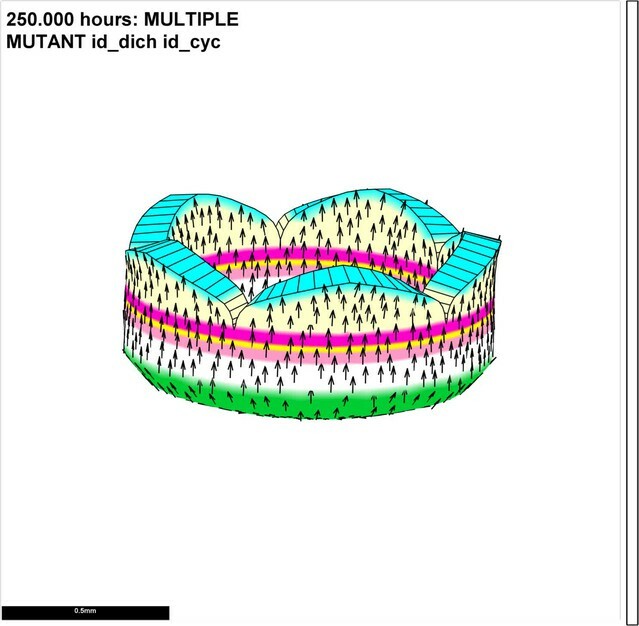 DIV, CYC, DICH) from the model generated phenotypes resembling those of the respective mutants (Figure 11A–D, Videos 26 and 27). These phenotypes were distinct from virtual mutants obtained by removing each tissue conflict from the wild-type model (Figure 9—figure supplement 1C and E–F). Removing the deflection of polarity at the sinus resulted in an overarching lower corolla (Figure 9—figure supplement 1D), suggesting that the deflection of polarity could play a role in refining corolla shape. Tissue-level models of dorsoventral mutants. Comparison between corolla shapes of virtual mutants generated by removing gene activities from the tissue-level model (A, C) and corresponding phenotypes of real corollas (B, D). Double mutant cyc dich (A,B) and triple mutant cyc dich div (C,D) are shown. For each panel, corollas are viewed from top (left), side (middle) and in longitudinal mid-section (right, position of section for the virtual corollas indicated by red line in middle panel). For the virtual mutants, regions highlighted are lip (dark pink), palate (pink) and rim (yellow). 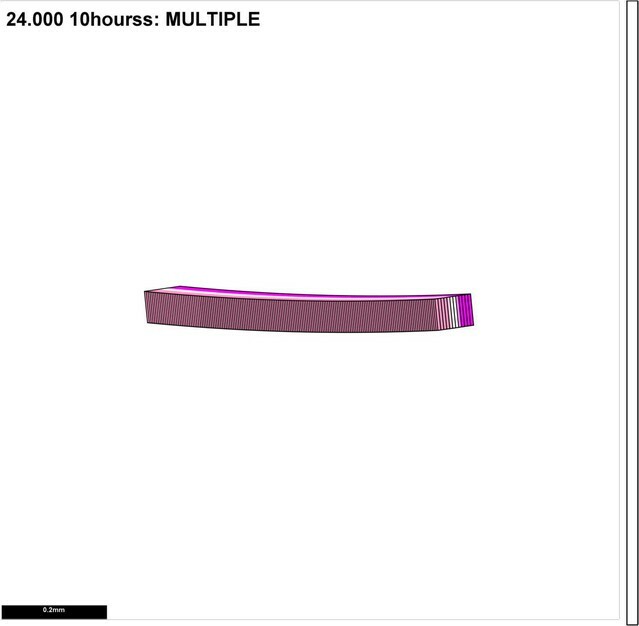 Wild-type full Snapdragon model as in Figure 10K. Size of canvas is rescale to better visualise the deformation of the canvas. 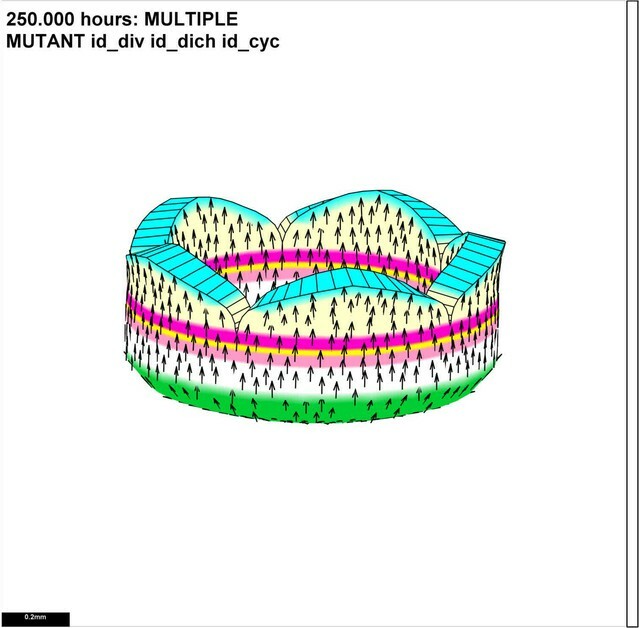 cyc dich double mutant model as in Figure 11A. cyc dich div triple mutant model as in Figure 11C. Summaries of growth regulatory networks (KRNs) used in models See materials and methods for full explanation. (A) Phase I of div domes. (B) Phase II of div domes. (C) Phase I of div domes with no surface conflict. (D) Phase II of div domes with no surface conflict. (E) Phase II of div domes with no orthogonal conflict. (F) Phase I of wild-type wedge. (G) Phase II of wild-type wedge. (H) Phase II of wild-type wedge with no surface conflict. (I) Ground state of full corolla model. (J) div mutant full corolla model showing new interactions (green) and modified interactions (blue). (K) Wild-type full corolla model showing only DIV-dependent interactions (green and bold). 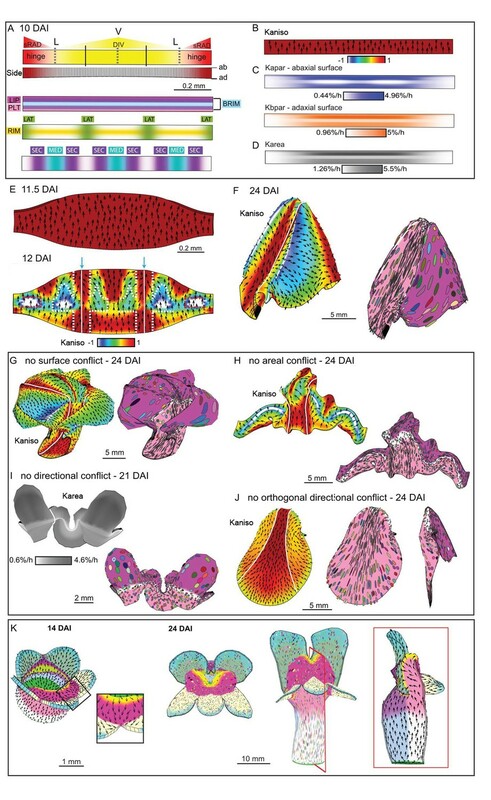 Through analysis of cell files, polarity patterns and computational modelling, we show that an orthogonal directional conflict plays a key role in generating out-of-plane deformations underlying the 3D Snapdragon corolla shapes of wild-type and dorsoventral mutants. This directional conflict interacts with areal and surface conflicts to generate the observed shape. We propose these conflicts are generated through combinatorial patterns of gene activity along different axes of the flower, which modulate local rates and orientations of growth, and hence the pattern of conflicts. Dorsoventral genes, such as DIV, affect all three types of conflicts to various degrees, which resolve to generate flowers with altered shapes in different genotypes. Computational modelling allows the role of each conflict to be revealed by simulations in which each conflict is removed, while preserving the others, producing virtual mutants with altered shapes. These phenotypes are distinct from virtual mutants obtained by removing dorsoventral gene activity from the model (Figures 9G–J and 10G–J and Figure 11A–D). The difference may reflect evolutionary history through which genes modulate conflicts in multiple ways to modify flower shape. The end result is that each gene, such as DIV, has an effect on multiple conflicts. Each conflict depends on combinatorial interaction of multiple genes, such as those specifying orthogonal domains needed for directional conflict. These expression domains are established along the mediolateral and proximodistal axes. Orthogonal gene expression domains are prevalent in development (Wolpert et al., 2015), although the genes establishing the orthogonal domains in the Snapdragon corolla remains to be identified. In addition to orthogonal domains, directional conflict also requires a system for providing axial information within each region that allows specified growth to be oriented. Axial information cannot be specified directly by gene expression levels which provide only scalar information (Lawrence et al., 2007). Axiality could be provided by a polarity field (Abley et al., 2013; Bosveld et al., 2012; Goodrich and Strutt, 2011) or through mechanical cues such as stresses (Aigouy et al., 2010; Heisler et al., 2010); (Hervieux et al., 2016). We hypothesise that the axial information is primarily provided by a polarity field, with growth rates specified parallel or perpendicular to it. PIN1 localisation reveals a tissue cell polarity pattern that it is largely proximodistal at early stages. At the time of repatterning, PIN1 is upregulated at the petal junctions, where polarity remains largely proximodistal, rather than being inverted distal to the foci as had been previously hypothesised (Green et al., 2010). Nevertheless, the growth orientations specified by these two polarity patterns would be similar, as specified anisotropic growth depends on axiality, which is the same whether the polarity is inverted or not. Thus, PIN1 localisation helps narrow down the possibilities for potential polarity fields guiding specified growth by providing data that cannot be inferred from growth analysis alone. Although remaining proximodistal along the petal junctions, PIN1 polarity is deflected during repatterning towards the sinus. Growth orientations follow this line of deflection, consistent with polarity orienting growth (Figure 8I–J). The direction of polarity in the flanking regions which undergo mediolaterally oriented growth is unknown, as PIN1 signal is not observed in these regions. For simplicity we assume the polarity is maintained as proximodistal in these regions, and growth is enhanced perpendicular to the polarity. These assumptions can generate a Snapdragon corolla shape similar to that of a previous model (Green et al., 2010). An alternative to polarity fields for orienting anisotropic specified growth is to employ the residual stresses generated by areal conflicts. This idea has been explored in the case of Arabidopsis sepal development (Hervieux et al., 2016), where it was proposed that stresses generated by differential isotropic specified growth could feed back to reinforce tissue regions in the direction of the local stress. Regions of tissue would then no longer grow isotropically if mechanically isolated (i.e. specified anistropic growth). However, simulations show that using local stresses to orient specified anisotropy does not allow a coordinated pattern of orientations to be specified (Hervieux et al., 2016). This is because growth feeds back to modify the stresses and destabilises their orientations. To get around this problem, it was proposed that average stress orientation across the sepal orient specified anisotropic growth (Hervieux et al., 2016). It is unclear, however, how such a sensing mechanism might operate and how it would allow an orthogonal pattern of orientations to be specified in the case of the Snapdragon flower. Whatever the mechanism for orienting specified growth, it needs be connected with cellular properties. A growing plant tissue can be considered as a deforming mesh of cell walls which yields continuously to cellular turgor pressure (Lockhart, 1965; Moulia and Fournier, 2009). This continuous process of mesh deformation is coordinated with introduction of new walls through cell division, keeping cell sizes within certain bounds and allowing mesh strength to be maintained as it grows. Specified growth depends on how genes control the degree of wall extensibility and cell turgor. Turgor pressure acts isotropically, while cell wall extensibility can be anisotropic because of the orientation and cross-linking of wall fibres such as cellulose. If a sheet of cellular tissue has uniform turgor and its walls have isotropic mechanical properties and yield to the pressure, the tissue gets uniformly larger. This situation corresponds to uniform isotropic specified growth (Figure 1B). Conflicts arise through spatial variation in turgor and/or wall extensibility. For example, the areal conflict illustrated in Figure 1H could arise if walls in the central region of a square tissue yield more readily in the plane to turgor pressure. 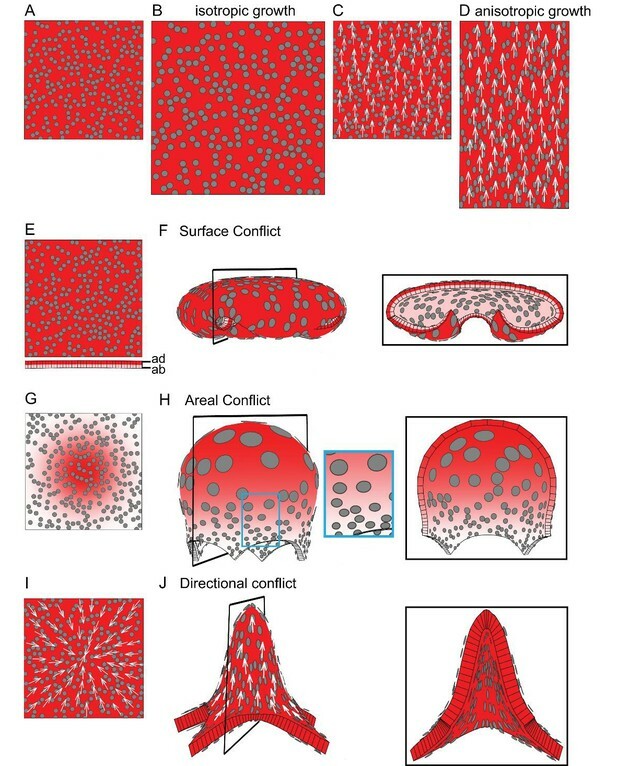 Similarly, the surface conflict in Figure 1F could reflect walls yielding more readily in the upper layer of cells of the tissue. Specified anisotropic growth depends on orientation and/or cross-linking of cellulose fibres in the cell wall, giving it anisotropic yielding properties. Tissue cell polarity could influence growth orientations by biasing alignments of microtubules (Hashimoto, 2015), or other processes influencing cell wall anisotropy (Cosgrove, 2016a, 2016b). Directional conflicts would then arise through variation in tissue cell polarity orientations and/or how cells modify wall extensibility in response to these orientations (e.g. wall stiffness parallel or perpendicular to the polarity, (Coen and Rebocho, 2016)). We show that tissue conflict resolutions can generate similar deformations with or without overall growth, suggesting they provide a flexible morphogenetic mechanism applicable to many systems (Figures 6 and 7). For example, pollen wall folding has been proposed to arise through differential shrinkage following water loss, which would correspond to areal and directional conflicts in shrink (negative growth) rates (Katifori et al., 2010). Gastrulation has been proposed to involve differential contraction of the apical and basal ends of cells, corresponding to a surface conflict (Conte et al., 2008). The formation of the Drosophila wing involves deformation and out-folding of an epithelial sheet in the imaginal disc. Cell divisions within the dorsoventral boundary region of the disc tend to be oriented orthogonally to divisions in the nearby wing disc (Baena-López et al., 2005; Mao et al., 2011), mirrored by orthogonal expression domains (e.g. Dpp, Wingless) (Neto-Silva et al., 2009). Formation of the wing may therefore involve a directional conflict. Animal epithelial deformations can also be generated in the absence of cell proliferation. 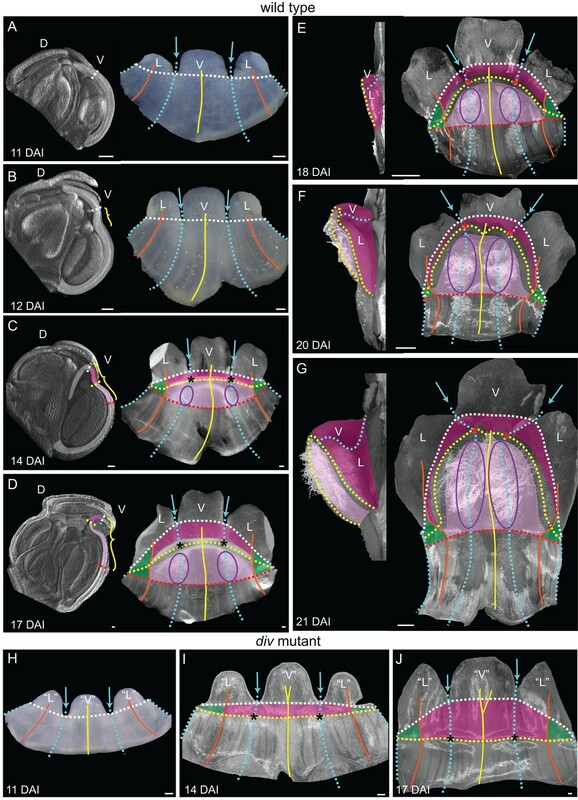 The dorsal appendage in Drosophila is proposed to arise through differential tension oriented along orthogonal expression domains, corresponding to directional conflict (Osterfield et al., 2013). Thus, similar types of tissue conflict resolution may underlie deformations for both plant and animal tissues, even though the underlying cell behaviours can be very different. According to the view presented here, tissue deformations arise through a dynamic interplay between gene activity and mechanical connectivity leading to local rotations through tissue conflict resolution. We show how genes can influence shape by changing the spatiotemporal pattern of tissue conflicts. This requires that genes modify local cell properties, such as wall extensibility in plants, actomyosin contractibility in animals, as well as tissue cell polarity (Coen and Rebocho, 2016). Outstanding questions are how such cellular properties are genetically controlled to produce the various types of tissue conflict, and how they are modulated during evolution to generate diverse shapes such as floral spurs and pitcher-shaped leaves. Antirrhinum majus (snapdragon) wild type (JI7 and JI2) and div-13 (Almeida et al., 1997) were grown in the greenhouse at the John Innes Centre. Using the published staging reference (Vincent and Coen, 2004) for JI2 flower development, we adapted it to JI7. Although these stocks are related, bud emergence and plastochron counts are slightly different in JI7. Therefore, we developed a JI7 staging reference by dissecting and photographing several flower bud series and relating bud features such as carpel, stamen and petal morphology between stocks as well as measurements such as petal width and lobe length. Imaging of buds and flattened petals was done using a stereomicroscope (Leica M205C). Bud age is referred to as Days After petal Initiation (DAI) of the flower meristem, and corresponds to the published reference system (Vincent and Coen, 2004). We used the JI7 reference system to stage the mutants. As the div-13 phenotypes have modified lower petals, we used the length and width of the dorsal petals to stage the mutant flowers at different stages of development. Snapdragon buds were dissected from inflorescences, sepals removed and the corolla opened and flattened on a drop of prostatic adhesive (technovent) placed onto a glass slide. At early stages the whole petal could be flattened onto the glue. At later stages, when wedge formation was deforming the lower petals, we tried to keep the 3D shape of the petals by only flattening the distal lobe and palate-tube regions. To follow the development of the wedge region from emergence until maturity in div-13 and wild-type, we used dissected and flattened material from staging experiments, as well as the OPT bud series, to mark different morphological landmarks that delimit the wedge, and made measurements on how this region grew. The measurements were done in imageJ. We used the same landmarks for div-13 and wild-type (exceptions indicated below). We used the lateral petal midvein as the mediolateral limit of the wedge, which was visible at early stages just after petal emergence at 8 DAI. To mark the upper and lower limits of the wedge along the proximodistal axis, we used the lip-distal lobe boundary and the palate-distal tube boundary, respectively. The petal-distal lobe boundary ran along the sinus of the petals, so to mark this boundary we drew lines from the D-L petal sinus to the V-L sinus as well as the two V-L sinuses. This morphological landmark was easily marked from the time of petal emergence. The proximal wedge limit could only be marked after 14 DAI, when palate trichomes emerged. This limit could not be marked in div-13 as the lower petals did not develop palate trichomes (due to absence of ventral identity). The rim position was visible from 14 DAI, as a furrow in flattened petals. Snapdragon flower buds were dissected from inflorescences, sepals removed and the buds prepared for OPT as previously described (Lee et al., 2006). Scanning and reconstructions were performed using a prototype OPT Scanner at the John Innes Centre. The 3-D images were visualised and processed using VolViewer software (http://cmpdartsvr3.cmp.uea.ac.uk/wiki/BanghamLab/index.php/Main_Page). Snapdragon inflorescences were harvested and hand cut to 1 cm thick, before fixing in phosphate-buffered saline (PBS) pH 7.5 containing 4% paraformaldehyde (RT-15710, EMS), 0.1% Triton-X100 and 0.1% Tween-20, overnight at 4°C. After dehydration (50% and 70% ethanol), samples were embedded in paraffin (wax paramat-361148C, VWR) using a Tissue-TEK VIP processor (Sakura). 8 µm sections were cut, mounted on polysine slides (VWR) and dried overnight at 42°C. Slides were dewaxed in histoclear (2x for 10 min) (HS-200, National Diagnostics) and hydrated through a decreasing ethanol series (made in 1x saline solution: 0.85% (w/v) NaCl). Slides were washed in PBS solution before digesting the tissue with Pronase (0.125 mg/ml, P6911 Sigma-Aldrich) for 12 min. A 0.2% (v/v) Glycine-PBS solution was used to block the Pronase activity (3 min, RT), followed by a PBS wash and another fixation step with 4% paraformaldehyde in PBS for 10 min. After a 2 × 10 min PBS washes, the tissue charges were neutralised using a 0.5% (v/v) acetic anhydride solution made in 0.1M triethanolamine pH 8.0, to minimise unspecific binding and background. Slides were washed in PBS and dehydrated though an increasing ethanol series (made in 1x saline solution) and left to dry for at least 15 min. To generate specific digoxigenin-labelled riboprobes probes, the ORF of AmPIN1a (F, 5’ATGATAACTTTATCTGATTTTTACCTG-3’ and R, 5’-TCATAGTCCCAGCAAAATATAGTAG-3’), AmPIN1b (F, 5’-AAAAATGATATCTTTATCTGATTTTTACC-3’ and R, 5’TCAAGTCCCAACAAAATATAGTAGATG-3’) and AmPIN1c (F, 5’ATGATCACTTTAACAGACTTATATCACG-3’ and R, 5’-CTAGAGTCCAAGCAAGATGTAGTAG-3’) were amplified using TAQ DNA polymerase PCR (201205, Qiagen) and cloned into pCR4-TOPO TA vector (K4575-01, Life Technologies) following manufacturer’s instructions. The cloned fragments were amplified using forward specific primers (AmPIN1a, 5’-GAGAAAGTGAAAGTGATGCCTCC-3’, AmPIN1b, 5’-CAATGAAGATGGTTACTTGGAG-3’ and AmPIN1c, 5’CCAAACCAACTGCAATGCCACC −3’) and the M13F primer (pCR4-TOPO kit), column purified (28104, Qiaquick PCR purification) followed by a phenol/chloroform extraction. Antisense probes were obtained by RNA transcription using the T7 promoter (10881767001, Roche) and DIG-UTP (11209256910, Roche), according to manufacture instructions. The AmPIN1a, AmPIN1b and AmPIN1c probes were hydrolysed at 60°C using 200 mM carbonate buffer pH 10.2 solution, for 80, 8 and 60 min, respectively. The hydrolysed probes were boiled in 50% formamide (4311320, Life Technologies) solution for 2 min and left on ice to cool, before adding the hybridisation buffer (per 5 ml: 625 µl 10x Salts (3M NaCl, 0.1M Tris-HCl pH6.8, 0.1M NaPO4, 50 mM EDTA), 2500 µl Deionized formamide (4311320, Life Technology Ltd), 62.5 µl tRNA (R4251, Sigma-Aldrich), 125 µl Denhardt’s(30915, Sigma-Aldrich), 437.5 µl RNase-free water, 1250 µl 50% Dextran Sulphate (D8906, Sigma-Aldrich)). Two microliters of hydrolysed probe plus 100 µl of hybridisation buffer were used per slide, and covered with Hybrislip hybridisation cover (HS6024-CS, Grace biolabs). Slides were hybridised in a humid box overnight at 50°C. Next day, slides were washed 3 times in 0.2x SSC solution at 55°C for 25 min. Single stranded RNA was digested with RNaseA (0.02 mg/ml, R4875 Sigma-Aldrich) in NTE buffer (10 mM Tris-HCl pH 7.5, 1 mM EDTA and 500 mM NaCl) at 37°C for 30 min. Slides were washed in 100 mM Tris.NaCl pH7.5 solution and then blocked using a freshly made 0.5% (w/v) blocking reagent (11096176001, Roche) in the same buffer, for 1 hr at room-temperature (RT). After a 30 min wash in 1% (w/v) BSA (A7906, Sigma-Aldrich) (made in 100 mM Tris.NaCl pH7.5 with 0.3% Tritonx100), slides were hybridised with a 1:3000 dilution of Anti-digoxigenin-AP antibody (11093274910, Roche) for 90 min. Slides were washed in 100 mM Tris.NaCl pH7.5 with 0.3% (v/v) tritonx100, 4 times for 25 min. Triton-x100 was removed from slides by washing them in 100 mM Tris.NaCl pH7.5 for 5 min. Before detection, the slides were washed in a 100 mM Tris.NaCl pH9.5 to equilibrate the pH. Detection was performed overnight using a NBT/BCIP (Promega) in 100 mM Tris.NaCl pH9.5 plus 50 mM MgCL2. The in situ experiments were performed three times. Protocol adapted from Conti and Bradley (Conti and Bradley, 2007). For section immunolocalisation, snapdragon inflorescences were harvested and hand cut to 2.5 mm thickness. Tissue was fixed in a 3.7% (v/v) formaldehyde (F8775, Sigma-Aldrich)-ethanol-acetic acid solution (FAA) with 1% (v/v) DMSO and 0.5% (v/v) Triton-x100, overnight at 4°C. After dehydration (50% and 70% ethanol), samples were embedded in paraffin (wax paramat-361148C, VWR) using a Tissue-TEK VIP processor (Sakura). 8 µm sections were cut, mounted on polysine slides (VWR) and dried overnight at 42°C. Slides were dewaxed in histoclear (2x for 10 min) (HS-200, National Diagnostics) and hydrated through a decreasing ethanol series. To improve antigen retrieval, slides were boiled in 10 mM citrate (pH 6) for 15 min and then left to cool for 30 min at room temperature. Slides were rinsed in deionized water and blocked in BB (5% (w/v) non-fat dry milk in PBS pH 7.5) at RT for 3 hr. Immunohybridisation of AmPIN1 was carried out overnight at 4°C using 1:500 primary anti-AmPIN1 antibody in BB. After washing three times (10 min) with PBS containing 0.3% (v/v) Triton-x100, the slides were hybridised with Alexa594-conjugated secondary antibody (Jackson ImmunoResearch, 1:500) for 3 hr. After incubation, slides were washed as after primary antibody incubation. Finally, slides were counterstained with 0.1% (w/v) calcofluor (F3543, Sigma-Aldrich) and mounted and imaged in 1% (w/v) DABCO (D27802, Sigma-Aldrich)/PBS/50% glycerol solution. For whole-mount immunolocalisation, buds were dissected and fixed flat onto a glass slide by glue as described in the dissection and flattening of lower petals section. The tissue was then fixed in a 3.7% (v/v) formaldehyde (F8775, Sigma-Aldrich)-ethanol-acetic acid solution (FAA) with 1% (v/v) DMSO and 0.5% Triton-x100, overnight at 4°C, after a short vacuum treatment. After two washes with 50% ethanol, the slides were washed with deionized water and boiled in 10 mM citrate (pH 6) for 15 min and then left to cool for 30 min at room temperature. Slides were rinsed in deionized water and blocked in BB (3% (w/v) BSA in PBS pH 7.5) at RT for 3 hr. Primary and secondary antibody hybridisation, washes and calcofluor staining were performed as described above. Tissue was mounted and imaged in 1% (w/v) DABCO/PBS solution. Number of replicas for calcofluor staining and whole mount PIN1 immuno of div mutant lower petals at various stages of development = 6. Number of replicas for calcofluor staining and whole mount PIN1 immuno of wild-type mutant lower petals at various stages of development = 11. Replicas gave similar results for similar developmental stages. The AmPIN1a, AmPIN1b, AmPIN1c and AmPIN1 (conserved peptide between all three PIN1 proteins) antibodies were produced in rabbit by Cambridge Research Discovery (CRB) using the following predicted antigenic peptide sequences present in the cytosolic loop domain. Peptide sequence for AmPIN1a -SRGPTPRPSNFEEE, AmPIN1b – HRGNNEDGYLERDEL, AmPIN1c – FSPASTKKKGENGKD and AmPIN1 -IYSMQSSRNPTPRGS. The clearest signal was obtained with the AmPIN1a antibody. The AmPIN1 antibody gave similar results but with more background. Scanning electron microscopy was carried out as described in Vincent and Coen (Vincent and Coen, 2004). In situ hybridised material was imaged using a Leica DM6000 and Nomarski settings, x10 dry lens, and a DFC420 digital camera was used to photograph in situ sections. All measurements made from in situ images were calculated using ImageJ software (http://imagej.nih.gov/ij/). Fluorescent immunolocalisation results were imaged using a Leica SP5 II confocal microscope and x25 water dipping lens. Images were acquired in a format of 1024 × 1024, with a line average of 4, scan speed of 600 Hz and pinhole of 1 airy unit. Excitation for Alexa 594 on laser 20% was with a 561 laser line, with a detection band of 570–630 nm. Calcofluor was imaged with a 405 diode laser and detection at 450–500 nm. Z stack images were at 1 µm/section. Image reconstruction was performed using the ImageJ software. PIN1 polarity was quantified using the PinPoint software, developed in MATLAB to analyse gene expression in cell boundaries. A composite stack of Anti-PIN1-Alexa594 and calcofluor staining was loaded into the program. For each cell segmentation, we determined which cell the PIN signal belonged to by manually scrolling through the z-stack. In ambiguous cases this determination was aided by PIN signal following the curvature of cell walls (Figure 8—figure supplement 2). A representative segmentation plane was chosen near to the cell’s midplane and the cell boundary was manually segmented. 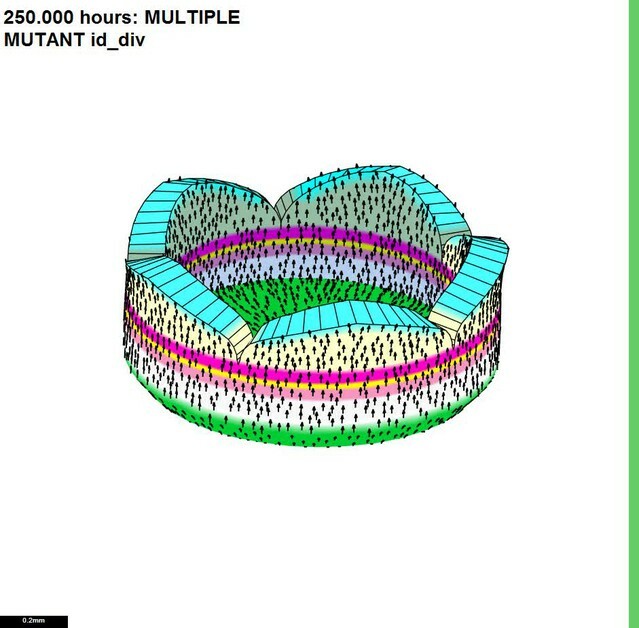 The segmentation was used to create an image mask of the cell. A second image mask was created for each cell by morphologically eroding the cell boundary with a disk-shaped structuring element of radius five pixels (≈1.5 µm). A difference image was created by subtracting the eroded mask from the original cell mask. For each pixel in the difference image, a vector was calculated using the PIN1 pixel intensity as magnitude and angle measured from the cell centroid to the pixel, relative to the x-axis as orientation. The sum of these vectors was used to represent the polarity of each cell. Average vector fields were calculated by summing vectors for each cell within a 30 × 30 pixel window. Mathematically, growth of a region is described by a growth tensor which can have both a strain (symmetric) and rotational (skew-symmetric) component (Hejnowicz and Romberger, 1984). A specified growth tensor has a strain component but no rotational component, as we assume that each tissue region exerts no intrinsic rotational force. However, a resultant growth tensor may have both strain and rotational components. If all regions are specified to grow in a similar manner and no external forces act on the tissue, specified and resultant growth are the same. This is a conflict-free situation and no local rotations are generated (the resultant tensor has no rotational component). By contrast, if specified growth varies across a tissue it may create situations of potential conflict which are resolved or reduced through local rotation (i.e. the resultant growth tensor has a rotational component). Local rotations provide degrees of freedom not part of the specified growth which can allow potential stresses to be reduced. We refer to this mechanism for generating local tissue rotations as tissue conflict resolution. In some cases, the potential conflicts in growth may be fully resolved through rotations, in which case the only difference between specified and resultant growth tensors is in the rotational component and there is no residual strain. For example, a conformal map is a planar deformation in which local rotations are generated through a gradient in isotropic specified growth without producing residual strain (Alim et al., 2016; Mitchison, 2016). If the tissue did not rotate locally to accommodate the gradient in specified growth, residual stresses would be generated. Thus, local rotations fully resolve the potential tissue conflict. In most cases, however, local rotations only partially resolve the conflicts and the specified and resultant growth tensors differ in the strain component (residual strain) as well as the rotational component. Some residual strain is inevitable in cases of tissue buckling (curvature through areal or directional conflicts), as the two surfaces of the tissue grow to a different extent, even though their specified strains are identical. Models are based on the Growing Polarised Tissue framework (GPT-framework) (Green et al., 2010; Kennaway et al., 2011). Tissue, is considered as a continuous sheet, termed a canvas, with two surfaces (A and B). Identity and signalling factors can be specified throughout the canvas and interact through a gene regulatory network (GRN). A growth regulatory network (KRN) controls the specified growth parallel (Kpar) and perpendicular (Kper) to the local polarity, established by taking the gradient of a diffusible factor POLARISER (POL). The production and degradation of POL depends on a polarity regulatory network (PRN). 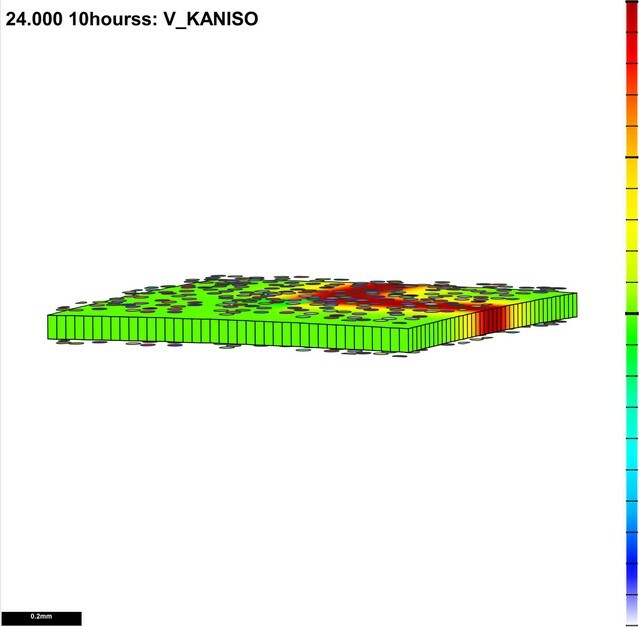 To visualise specified anisotropy, we calculate Kaniso = ln (Kpar /Kper) and display its local value using a colour scale. 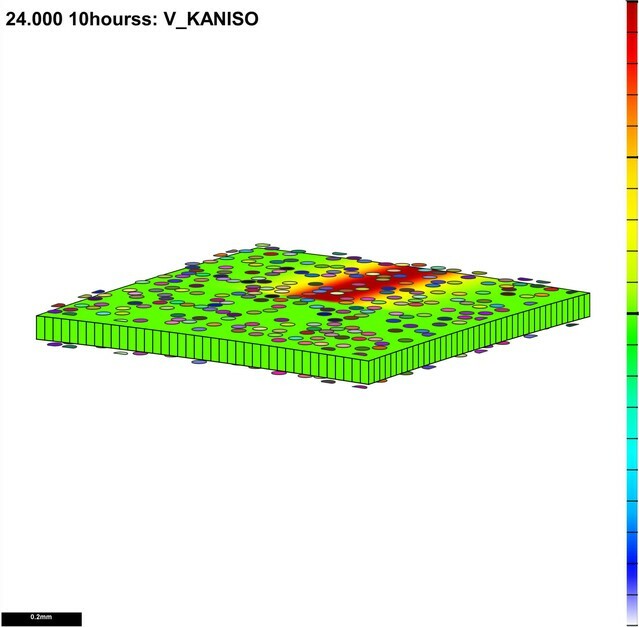 If growth is isotropic (Kpar = Kper), Kaniso = 0. Specified areal growth rate is given by Karea = Kpar + Kper. To illustrate how various types of tissue conflict resolution lead to curvature, we use an initial square with very slight curvature and marked with circular clones. where Knor is specified growth rate in canvas thickness. where icentre is an identity factor with a level of 1 at the centre of the canvas from where it gradually declines radially. As in Figure 1G,H but starting with a flat canvas with a small amount of random perturbation in the z-plane. As in Figure 1I,J but starting with a flat canvas with a small amount of random perturbation in the z-plane. where the distribution of sjun and srim are as in Figure 6A and B respectively. Note that Karea=Kpar+Kper=0.1, and is therefore uniform throughout the canvas (ensuring no areal conflict). where ihalfside is a factor expressed in the left half of the canvas (Figure 6C). where idistalhalf has the distribution shown for DISTALHALF in Figure 6D. where imargins defines regions flanking the channel. Figure 6—figure supplement 1A,B. Combining directional and areal conflicts. where iedge has a complementary distribution to icentre. Parameters were chosen such that the final canvas size remained roughly constant. Dorsoventral axis: the dorsally expressed gene RAD is expressed at the most lateral petal edges and produces a signal (sRAD) that diffuses into the lateral petals (hinge region) and inhibits the ventrally expressed gene DIV. Proximodistal axis: PALATE (PLT) is expressed in the proximal region. PALATEPROX (PLX) is expressed in the most proximal part of the palate. RIM is expressed at the distal limit of PLT. RIM promotes production of sRIM which diffuses and activates BRIM when the levels of sRIM are higher than 0.01. LIP is distal to RIM and is subdivided in the proximal region, LIPCLIFF (LIF), and a distal region, LIPDISTAL (LIS). Mediolateral axis: graded factors are sMED, which is centred on the petal midvein, sSEC, which is centred on the secondary veins, and sLAT which is centred on the junction between petals. Sectors (circular regions) were induced at around 12.5 DAI, with initial sector size scaled to the initial size of a cell (~10 µm). Growth in canvas thickness was maintained at 0.44 %/h in all models. where pro (x, yz) promotes factor yz by an amount x, and inh (x, yz) inhibits factor yz by an amount x (Green et al., 2010). To promote the bending of the canvas at rim region, Kpar on the A surface was inhibited by sRIM where it exceeded at threshold value, except for near the hinge, where sRAD is high. The KRN for Phase I is summarised in Figure 12A (activation as black arrows and inhibition as red lines). These interactions are summarised in Figure 12B, with orthogonal directional conflict interactions in green. The above KRN is modified, with removed interactions marked with a red cross as shown in Figure 12C (Phase I) and Figure 12D (Phase II). The multiplying factor 0.025 was chosen to prevent the canvas becoming too big. POL is not produced and therefore no polarity field is established. The modified KRN with removed interactions marked with a red cross is shown in Figure 12E. 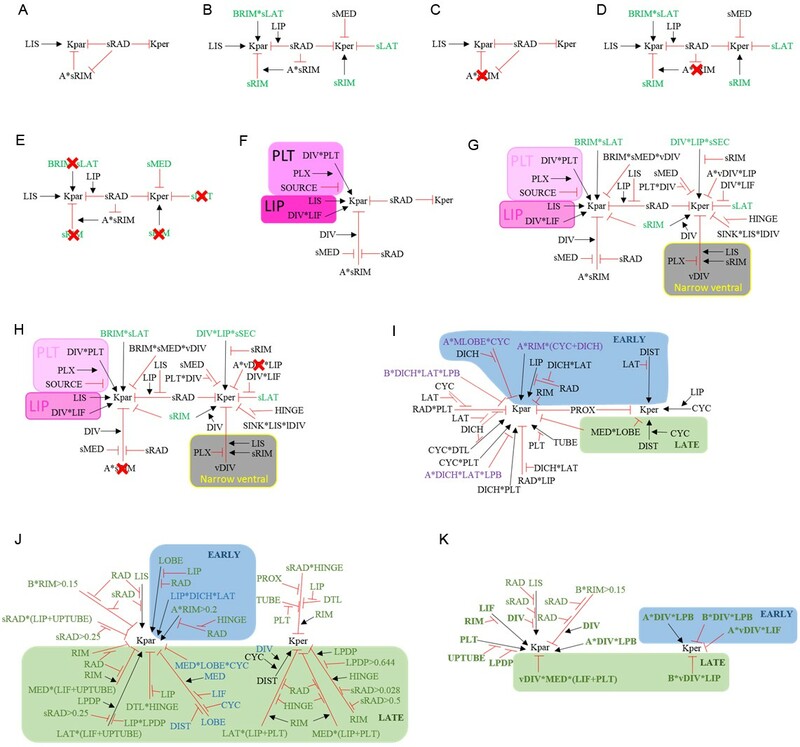 Figure 12 F shows a summary of KRN for Phase I, with the network promoting PLT and LIP growth highlighted. At the start of phase II polarity is deflected by establishing a new site of POL degradation at the SINUS (intersection between the petal junctions and distal lip). The deflection of polarity was made specific to the adaxial (B) surface of the canvas by freezing polarity on the A surface, preventing it from reorienting. A summary of the KRN is given in Figure 12G with orthogonal conflict interactions in green and the interactions responsible for keeping the ventral petal narrow in a yellow box, (vDIV represents the ventral DIV expression domain, where DIV level exceeds 0.95). 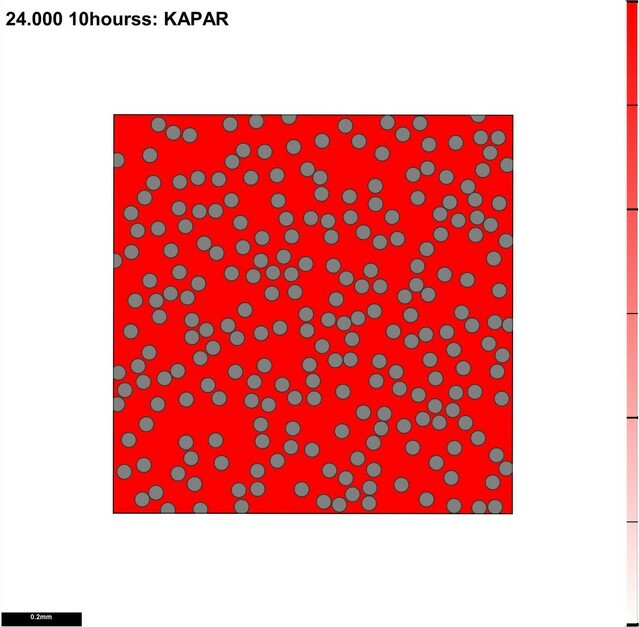 Differential growth between canvas surfaces in Kpar at sRIM and Kper at ventral lip removed (Figure 12H). Areal growth rates normalised as described for div in Figure 9H. Interactions in shown in green in the KRN (Figure 12G) removed. The models have three stages: (1) Step-up phase (9 DAI), when the polariser gradient, the expression pattern of most identity and signalling factors are established (patterns are maintained throughout simulation unless otherwise stated) (2) 10–13 DAI, during which EARLY factor is expressed and (3) 14–24 DAI, during which LATE factor is expressed. The PRN is as described in the set-up phase for the previously published model (Green et al., 2010), and the polarity field maintained throughout the entire corolla development, except in the wild-type model (see below). The POL gradient is frozen on both surfaces in the tube region during EARLY and in the lip region during LATE. Virtual sectors are induced around the repatterning stage (14 DAI). Growth in canvas thickness is 0.3 %/h. To facilitate comparisons, equations have different colours depending whether they are common between the published and the current model (black), present in published model but modified in the current model (blue), present in the published model but removed from the current model (red) or new to the current model (purple). Equation numbering is as in Green et al. (2010): Kpar equations are K1, Kper equations are K2, surface differential equations Kpara are K3, Kparb are K4, Kpera are K5 and Kperb are K6. All genetic interactions in the published model for wild type under the control of DIV or LTS (LATERAL PETALS) which modulate specified growth rates in lower petals (see red equations below) are removed to produce a corolla without out-of-plane deformations in the lower petals. Summary of KRN for ground state is given in Figure 12I. Several new regions are created to incorporate genetic interactions defined in the wedge models described in Figures 9 and 10: SECVEIN (SEC), expressed at the secondary vein position of each petal and producing signal, sSEC; LIPCLIFF (LIF), expressed at the proximal region of the LIP; and LIPDISTAL (LIS), at the distal region of the LIP. In the published model, DIV is initially expressed uniformly across the lower petals and becomes graded at 14 DAI, due to inhibition by LTS (expressed at the hinge region of the laterals). In the current model, DIV is graded from early stages through inhibition by sRAD. The sRAD signal is produced in the dorsal petals and diffuses into lateral petals, where it activates the HINGE identity factor (instead of LTS) and LPDP identity factor at the lateral-dorsal petal junction. Kpar in the dorsal and lower petal lobes modified (modified K.1.6a and K.1.6b and new K.1.20) and growth of the LIP in the DICH region boosted (modified K.1.4b). Kpar boosted by LIPDISTAL (LIS) in lower petals while inhibited by HINGE. This activation is reduced by LATE (K.1.16 and K1.17). Kpar and Kper both inhibited in the hinge region by sRAD, particularly in the LIP and PLT (K.1.18 and K.2.10, respectively). Kpar in DISTAL LOBE (DTL) promoted at the hinge region (K.1.19). Kpar inhibited by MED in combination with LIF and UPTUBE, particularly at the rim of the lower petals (K.1.21). The proximodistal arms of the orthogonal directional conflict are specified by boosting Kpar at the petal junctions (with LAT, excluding dorsal-dorsal junctions) specifically at the regions of LIPCLIFF (LIF) and distal palate (UPTUBE), with the exception of the lateral-dorsal LIP region where Kpar is inhibited (K.1.22). Additionally, Kpar at the rim is inhibited (K.1.23). The mediolateral arms of the orthogonal directional conflict are established by promoting Kper with sRIM flanking the petal junctions, excluding the dorsal petal junction, and inhibiting Kper in with LAT and MED in combination with LIP and PLT (K.2.11-K.2.13). A summary of KRN for the div mutant, showing only new interactions (green), and modified interactions (blue), is given in Figure 12J. Equations as in previous section with those establishing the orthogonal growth orientations (K.1.22, K.2.11 and K.2.13) removed. DIV promotes Kpar with LIF (K.1.24 and K.1.25). DIV promotes Kpar with PLT (K.1.26 and K.1.27). DIV inhibits Kpar with MED in the ventral petal to generate ventral furrow (K.1.28). DIV extends the region of high Kper into the LIP at the position of the secondary veins (sSEC) (K.2.14). DIV inhibits Kper when above a certain threshold (narrowing its expression to the ventral petal - vDIV) (K.2.15). DIV inhibits Kper in the lateral petal lobe, keeping the distal edge of the LIP narrow and allowing the proximal region of the lip to bulge out slightly (K.2.16). This is further enhanced by the differential surface Kper at the LIP (K.5.3 and K.6.3). DIV promotes Kpar with RIM (K.4.3a). DIV also activated a new region of polariser degradation at the SINUS (region at the intersection between the petal junctions and top lip nodes) at the repatterning stage (14 DAI). Upon the activation of this new polarity sink, the polarity field deflects towards the sinus. The deflection of polarity is kept specific to the adaxial (B) surface of the canvas by freezing the polarity at the A surface, preventing it from reorienting. Summary of KRN for wild-type depicting the DIV-dependent interactions alone (green and bold interactions) is given in Figure 12K. To test the contribution of the different types of tissue conflicts to the shape of the wild-type Snapdragon corolla, we removed each of the conflicts independently. Orthogonal conflict equations (K.1.22, K.2.11, K.2.13 and K.2.14) removed. Region of polariser degradation at the SINUS removed. Surface differential equations K.3-K.6 removed. Areal growth rates normalised as in Figure 9H. Journal of the Mechanical Behavior of Biomedical Materials 1:188–198. "Sur une condition fondamentale d'équilibre des cellules vivantes"
Comptes rendus de l'Académie des Sciences 103:822–824. International Journal of Plant Sciences 153:S59–S75. Journal of Theoretical Biology 110:93–114. Planar cell polarity: one or two pathways? Journal of Theoretical Biology 408:155–166. Journal of Experimental Botany 60:461–486. In: A Carbone, M Gromov, P Prusinkiewicz, editors. Pattern Formation in Biology, Vision and Dynamics. Singapore: World Scientific. pp. 252–286. Annual Review of Cell and Developmental Biology 25:197–220. Canadian Journal of BotanyRevue Canadienne De Botanique 82:681–690. Birth Defects Research Part C: Embryo Today: Reviews 96:132–152. Thank you for submitting your article "Generation of shape complexity through tissue conflicts" for consideration by eLife. Your article has been reviewed by three peer reviewers, and the evaluation has been overseen by Naama Barkai as the Senior Editor and Reviewing Editor. The following individual involved in review of your submission has agreed to reveal her identity: Ottoline Leyser (Reviewer #2). The authors study the process of tissue deformation, focusing on the petal deformation during the development of the bee landing pad in the snapdragon flower. The key question addressed is how such deformation results from individual cell behavior. 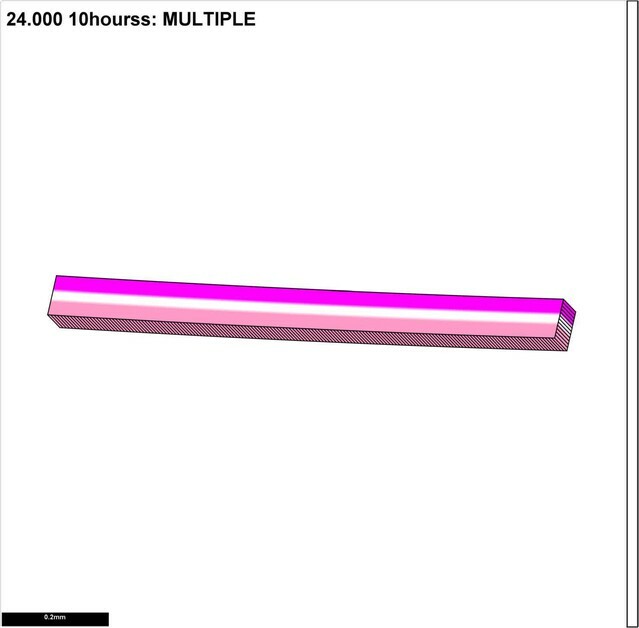 As main tools, the authors combine experimental methods that allow to quantitatively follow tissue growth with computer simulations. As a main result, the authors propose the framework of 'tissue conflict', the idea that deformation can result from differences in the growth behavior of individual cells, and which result from specific patterns of gene expression at the cellular and tissue level. All reviewers recommended this paper as an excellent contribution to this field that should be of wide general interest because of the important conceptual advance in provides. As you will see below, however, there are points raised which require clarification before publication. Most of these points do not require new data but a better explanation and/or exploration of the existing data and its interpretation, and wider consideration of alternative interpretations. We would like to ask you therefore to address all requests. 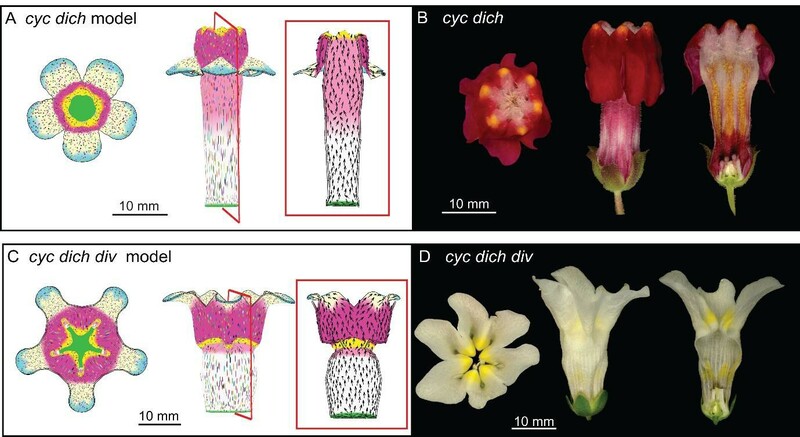 The experiments and modeling aimed at elucidating the role of DIV in shaping snapdragon flowers provide a nice complement to other recent works from the Coen lab (Eldridge et al. 2016 Development, Sauret-Güeto et al. 2013 PLoS biol, Kuchen et al. 2012, Green et al. 2010 PLoS Biology, Kenneway et al. 2011 PLoS Comp Bio) illustrating how genetically specified growth and mechanics can shape organ form. In this framework the concepts of specified and resultant growth have been very valuable. A systematic examination of growth patterns leading to out-of-plane deformations is interesting and useful for the understanding of the emergence of organ form. The simulation study at the start of the manuscript is a step in this direction, and extending this exploration into something more substantial would represent a significant contribution. A key difficulty with the manuscript is that the central concept of "tissue conflicts" is not sufficiently well-defined. Specifically, it is not clear how "tissue conflicts" are related to aspects of growth (specified or resultant) or mechanics (stresses, strains and residual stresses). Comments in the manuscript seem to imply that "conflicts" either correspond to situations when specified growth induces residual stresses (e.g. Introduction: "Even though growth is isotropic, anisotropies result from areal conflict"), or growth is non-uniform. Either case seems somewhat problematic. Residual stresses may in some cases be sufficient to generate out of plane deformations, however it is unclear whether they are from a theoretical perspective necessary. 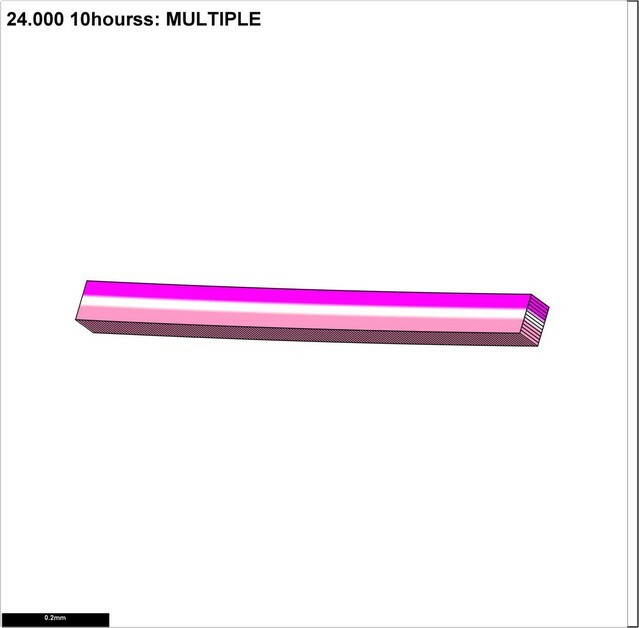 Consequently, it is unclear whether and to what degree residual stresses drive generation of 3D forms, or are a common by-product of growth that sometimes feeds back to geometry. Similarly, non-uniform growth does not necessarily lead to out of plane deformations. For instance, Coleocetae has very non-uniform growth but none the less remains flat (Dupuy L, Mackenzie J, Haseloff J. 2010. Coordination of plant cell division and expansion in a simple morphogenetic system. Proceedings of the National Academy of Sciences, USA 107: 2711-2716). In either case, it is unclear what conceptual clarity is gained by introducing the notion "conflicts" or if there can be a proper mathematical conceptualization of a conflict-something which we have for residual stresses and growth. The danger therefore is that precise formulations are replaced with an appealing but imprecise notion. 1) Initial cell geometry presumably has a strong impact on the cell division patterns in the cell file simulations presented in Figure 3. Without quantifying this effect, how is it possible to accurately interpret the results of these simulations? This seems a key issue to resolve. 2) Cell divisions in cell file simulations are performed by splitting cells along the shortest wall passing through the centroid. As this divides cells according to Errera's rule, it is unclear why the authors have chosen to cite Besson and Dumais (PNAS 2011) instead of Errera's original manuscript (Errera L (1886) Sur une condition fondamentale d'équilibre des cellules vivantes.). 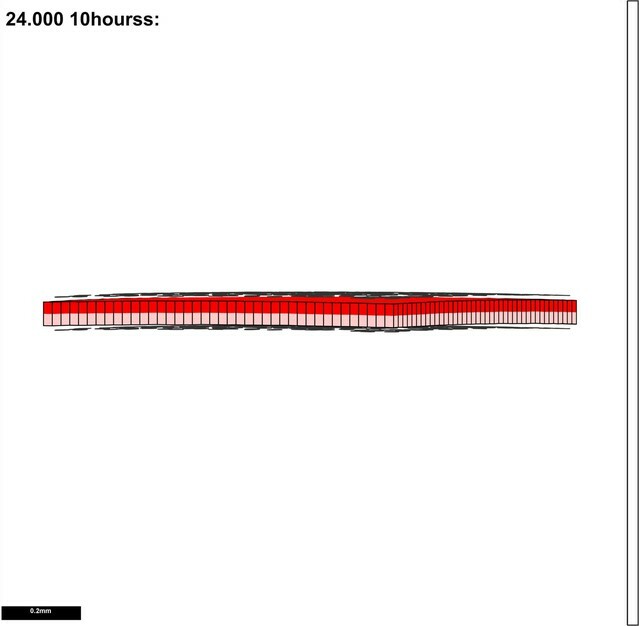 The simulated patterns presented in Figure 4 also appear to incorporate shortening of the new cell wall, which is not considered by Besson and Dumais, but instead the cell division method proposed in Nakielski, J. (2000) in Pattern Formation in Biology, Vision, and Dynamics. 3) Examining the longitudinal midsections of WT flowers in Figure 3, the form of the lower corolla appears to closely follow the anatomy of organs enclosed by the petals. This seems relevant but the authors do not seem to comment on it? As similar images are not provided for div mutants it is thus unclear to what degree the observed differences in corolla form between mutant and wild-type plants may relate to differences in the growth of adjacent portions of the flower. 4) The PIN quantification tool is interesting. A major challenge however is how to confidently quantify amount of signal at each side of the wall. The two flanking membranes are very thin and the signal is generally not sufficiently discrete in the magnifications they are looking. I can see how quantification would work for total amount of signal in the two sides flanking a wall but if they can quantify each side they need to explain the method more clearly. How do they deal with problems introduced by many sections being oblique which would skew the relative signal to the wall or slight non-uniformity in staining? How does calcofluor affect the method? Overall it would seem appropriate to provide information on fidelity and accuracy of the method. 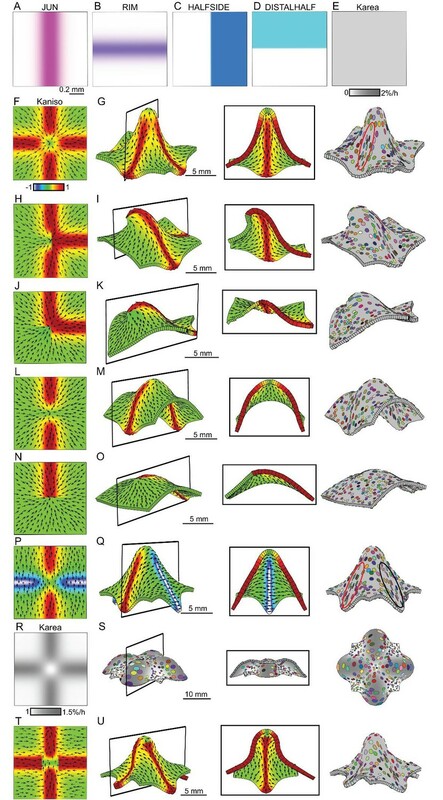 This paper introduces the idea of tissue conflict as a "general framework for viewing out-of-plane deformations with or without overall growth" during morphogenesis. I prefer the term "framework" as used here, to "mechanism" as used elsewhere in the paper. The value of this framework is illustrated in the context of the analysis of petal deformation during the development of the bee landing pad in the snapdragon flower. The tissue conflict concept extends a conceptual toolbox generated by this team, encapsulated in a computational modelling environment. This work has provided important insights into the process of morphogenesis, which remains a largely enigmatic area of developmental biology because of the difficulty of thinking coherently in 4D. The addition of the tissue conflicts idea seems to me very promising, and this is successfully illustrated by the insights it provides into petal deformation, as regulated by the DIV gene. The paper has the difficult task of presenting 4D results, both in general and in the specific case of the snapdragon corolla. The authors do a good job of leading the reader through these complexities. I have suggested some additions below that would have helped me further, but I recognize that different people will find different narratives/illustrations helpful. In the Discussion, the authors consider how their framework for the analysis of morphogenesis compares to others in the field. They also consider the molecular-cellular basis for the properties they propose. These aspects are extremely helpful in allowing the reader to understand the relationship between the various heuristics currently in use. Overall, I find this paper to be an excellent contribution to this field that should be of wide general interest because of the important conceptual advance in provides. 1) For me the OPT sections presented in Figure 3 provided a much easier entry point to understanding the out of plane deformations of interest than the illustrations in Figure 2. Could some sections of this sort be added to Figure 2? 2) I would have liked a more precise definition of exactly how the red, yellow and orange inferred growth orientation lines were drawn. For example, in Figure 5 the growth orientation lines in the zoomed in box from B do not map well onto the lines in the zoomed out image. Presumably the authors generated some scale-based rules for exactly how to draw these lines. These could maybe be included in Figure 4 where the approach is introduced. 3) I would have found it helpful if Figures 9 and 10A–D were more directly comparable, with equivalent illustrations presented in the same order even where there was no difference. DIV is required to work quite hard and it is important to be able to grasp quickly the extent of its activities. 4) It would be helpful if the Discussion included a section on how resultant growth might be generated at the cellular level. This is an elegant and overall well-executed study on morphogenesis in snapdragon petals. In addition, the paper is written enthusiastically and pedagogically. I nevertheless have a few reservations. 1) "Growth conflict", as termed by the authors, is a concept that has a long history including in previous work of the Coen group. It may be called "embedding of surfaces" in mathematics (e.g. work of John Nash), "incompatible strain" in applied mathematics (e.g. Lewicka et al.) or "non-Euclidian metric" in physics (e.g. Sharon et al. ), as well in developmental biology (e.g. Paul Green, referenced in the paper). The main contribution of the present study is to characterize a case were spatial differences in growth are directional (instead of differences in areal growth as in previous studies). 2) It is possible to achieve the same 3D shape by various patterns of 2D growth, notably a pattern with no conflict (where resultant and target growth are identical). What is the experimental evidence that leads the authors to exclude an explanation with no conflict? 3) As stated by the authors, the 3D shape arises from residual stresses due to the spatial differences in growth rate or direction. However, they neglect mechanical stresses/forces due to other floral organs. Are other organs really negligible? For instance, is petal shape influenced by homeotic conversions of stamens? 4) It is unclear what are the causal links between directional growth, cell divisions, and/or PIN1a polarity, and the putative underlying polarity field. How far do cell divisions show the main direction of growth? How independent is PIN1a localisation from the orientation of recent divisions? […] A key difficulty with the manuscript is that the central concept of "tissue conflicts" is not sufficiently well-defined. Specifically, it is not clear how "tissue conflicts" are related to aspects of growth (specified or resultant) or mechanics (stresses, strains and residual stresses). Comments in the manuscript seem to imply that "conflicts" either correspond to situations when specified growth induces residual stresses (e.g. Introduction: "Even though growth is isotropic, anisotropies result from areal conflict"), or growth is non-uniform. Either case seems somewhat problematic. The reviewer raises an interesting point. 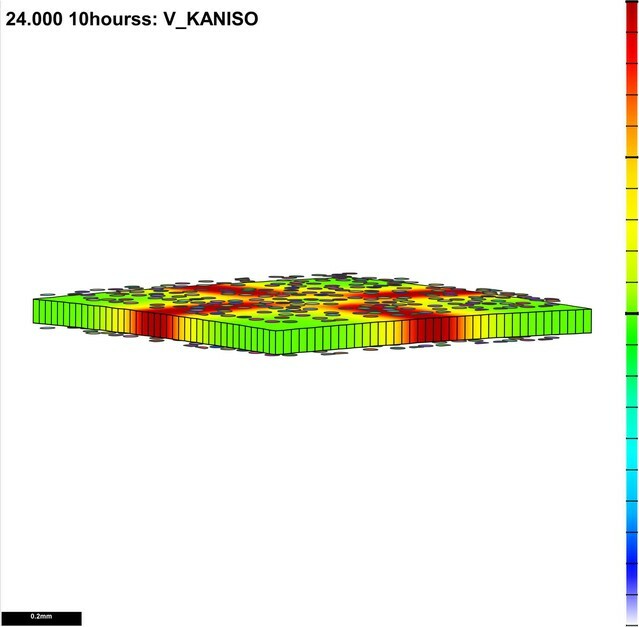 To address it we did simulations with various initial cell geometries. The resultant division patterns are very similar, although the outlines of the clones have a different shape. We have mentioned this finding in the Results (subsection “Morphogenesis of wild type and div”, seventh paragraph) and included a supplementary figure (Figure 4—figure supplement 1). The reviewer rightly points out that the corolla tube follows the shape of the anther for some of its length and raises the question of whether the anther may have a role in shaping the petal. One argument against this is that in plena mutants, in which stamens are replaced by petals, corolla shape in whorl 2 is similar to wild-type. We now cite this finding in the Introduction (second paragraph, see also response to reviewer #3 below). We have added some close-up images of cells in the Supplementary material (Figure 8—figure supplement 2L) showing the calcofluor and PIN signal. These images show that PIN signal can usually be localised to one side of the wall. We have also further clarified the description of the method (subsection “Quantifying PIN1 polarity”), explaining that a section near the midplane was chosen for each cell as this reduces the problem of obliqueness and non-uniformity. We thank the reviewer for bringing this problem to our attention, which indeed reflects the complexity of conveying shape change in 4D as the reviewer points out. Currently we give the mature flower phenotype first (Figure 2) and then its development (Figure 3). The OPT sections in Figure 3 are easier to understand because they are less complex than those of the mature flower (there are fewer overlaps and folds). For this reason, we would prefer to keep the current arrangement. Given that the description of Figure 3 follows on immediately from Figure 2 we hope this is acceptable. We thank the reviewer for pointing out this issue. Confusion seems to have arisen in relating the zoomed-in and zoomed-out versions. This is because we chose to show only the clearest regions of oriented division in the zoomed-out version. Thus, only the left region of the box from B is shown as red lines in the zoomed-out version. We have clarified this point by giving a fuller explanation in the figure legends and by correcting the zoomed-in version of B with some extra yellow lines that had been left out by mistake. 3) I would have found it helpful if Figures 9 and 10A-D were more directly comparable, with equivalent illustrations presented in the same order even where there was no difference. DIV is required to work quite hard and it is important to be able to grasp quickly the extent of its activities. We thank the reviewer for this suggestion. We have revised Figure 10A-D and incorporated elements from Figure 9A-D to make it more comparable. We thank the reviewer for raising this point. We did not include a more detailed discussion of cellular mechanisms to keep the paper short. We have now given a more detailed description of cellular level analysis in a recent review (Coen and Rebocho, 2016) and cite this in the paper at the end of the Discussion. As with our response to referee #1 we have clarified our definition of tissue conflict resolution in the Introduction and Materials and methods, to make it clearer that it is a mechanism for generating local rotations, whether or not residual strain is involved. We agree with the reviewer that a major contribution of our paper is to characterise a case where deformation involves conflicting orientations of growth, but we felt it important to place this type of interaction in relation to other forms of tissue conflict resolution. As we now mention in the Introduction, curvature can arise without tissue conflict resolution through external forces being applied to the tissue. We point out that the normal corolla shape of organ identity mutants argues against this type of mechanism playing a major role (see also response below). There can be cases of tissue conflict resolution in which no residual strain is generated (e.g. conformal maps mentioned in the mathematical definition of tissue conflict resolution). However, this does not apply to the buckling mechanisms we describe and give evidence for (i.e. 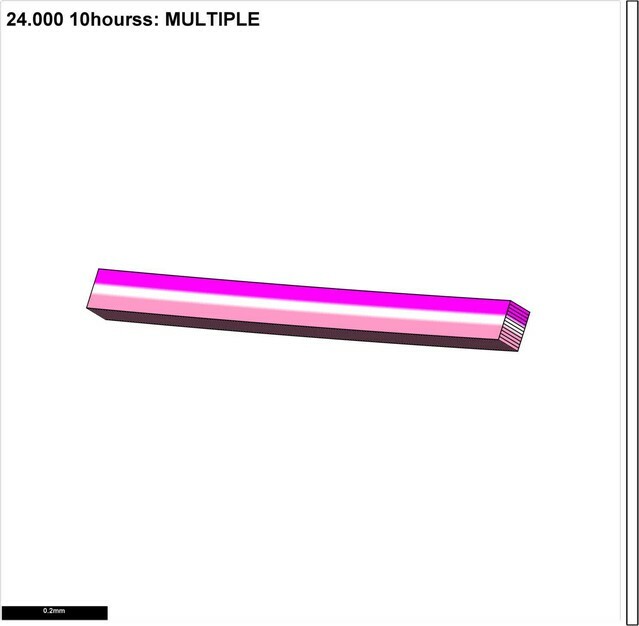 cell file analysis and modelling), as residual strains are necessarily generated as the two surfaces of the tissue attain different resultant areas (even though they are specified to be the same). We thank the reviewer for raising this point. We have now pointed out in the Introduction that an alternative to tissue conflict resolution is that deformations arise through forces from other tissues. Evidence against this come from the observation that corolla shape in whorl 2 in plena mutants, where stamens are converted to petals, is similar to that in wild type, indicating that stresses from whorl 3 do not have a strong effect on petal shape. We have clarified the causal relationships between cellular behaviours and tissue growth in a recent review (Coen & Rebocho, 2016), now cited in our paper. For our simulations we make the plausible assumption that the plane of cell division does not directly direct growth but reflects the pattern of growth. We see a correlation between PIN1a localisation and orientations of division walls, the most notable being the correlation between diagonal walls and deflected PIN1a polarisation (noted in the sixth paragraph of the Discussion). We thank all the members of the Coen lab for helpful discussions. Thank you Sarah Hake, Graeme Mitchison, Desmond Bradley, Christopher Whitewoods, Manuela Costa, Catherine Mansfield, Beatriz Gonçalves, for comments on the manuscript. A special thanks to Jonathan Keep for moulding the div and wild-type clay models. We thank Lucy Copsey and Catherine Taylor for their help with plant material. We also thank Grant Calder for the confocal microscope support. A.B.R was supported by an EMBO-long term fellowship (ALTF 568–2008) and HFSP long-term fellowship (LT000563). The author’s research was supported by the UK Biotechnology and Biological Research Council (P.S, J.A.B, J.R.K. and E.C., BB/J004588/1.). We would like to dedicate this article to the memory of Andrew Bangham, our dear friend and collaborator, for all his enthusiasm, work and support on this project. © 2017, Rebocho et al.